Comments Enter your password to view comments. 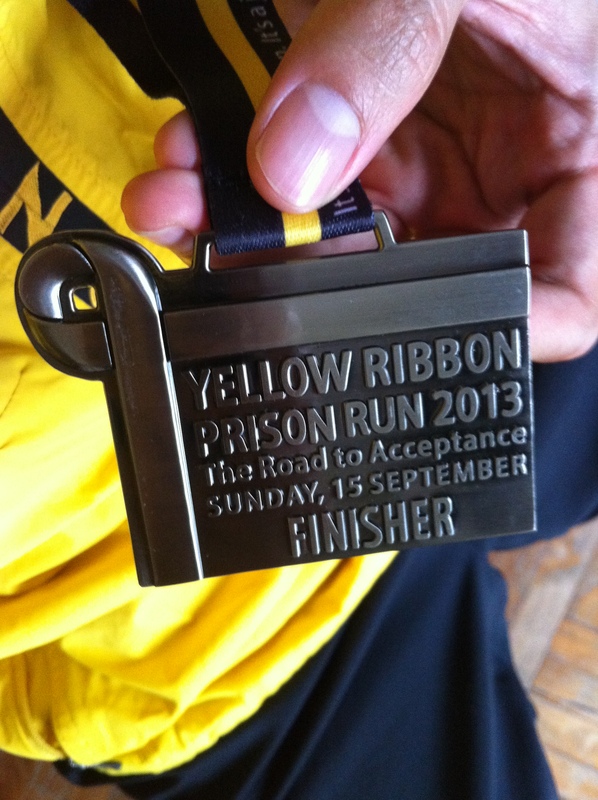 Yellow Ribbon Prison Run ’13 marks the final back-to-back race I signed up for within a hectic 6 week window. I never made a bad decision in my life, or rather, when I make a decision, I always take everything into consideration at that point of time, it always seemed rational. But when I look back in hindsight, some of the decisions I have made are seemingly ridiculous come to think of it. But I’ll never regret a decision, because for some reason when I made that decision, it was a thoroughly considered choice. Yes, one of those ridiculous decisions was to register for so many races back-to-back. Racing every weekend can seem to be a whole load of fun. Its like living for the weekend. The euphoria of finishing is just something that I thrive on, as do many others. But there is no chance for the body to recover from the fatigue from the race & leverage on that super compensation of your workout & raise your base level . Because by the time you have recovered from the race, its time to do your hard work outs again & there is absolutely no time to absorb the goodness of your workout. Consequently, your base level does not improve significantly. My main consideration for these group of races was to smash my PB & get a SUB40 10k. 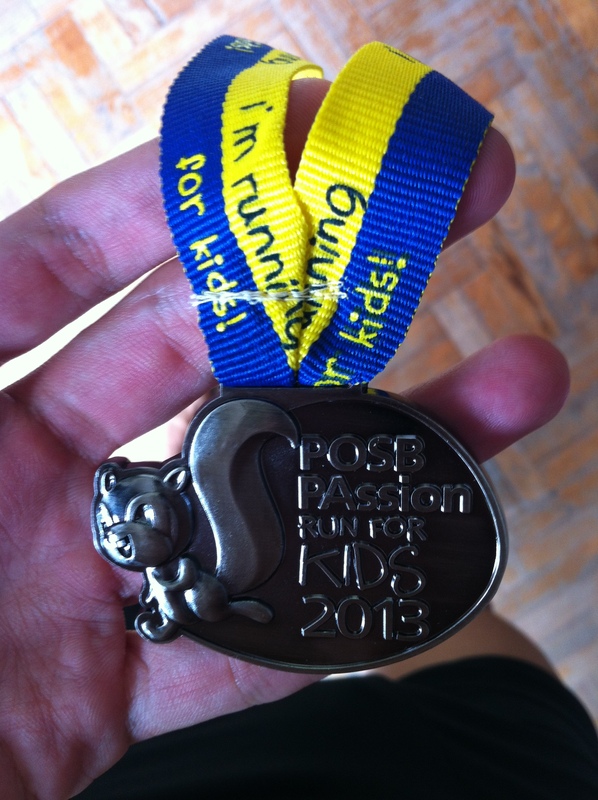 I wanted to put myself in a position where I had as many chances to do it, which I eventually did in empathic style in the POSB PAssion Run for Kids ’13. Now that I did a SUB40 10k, now what? where do I go from here? Yes, just a glance at the header of my blog says it all. 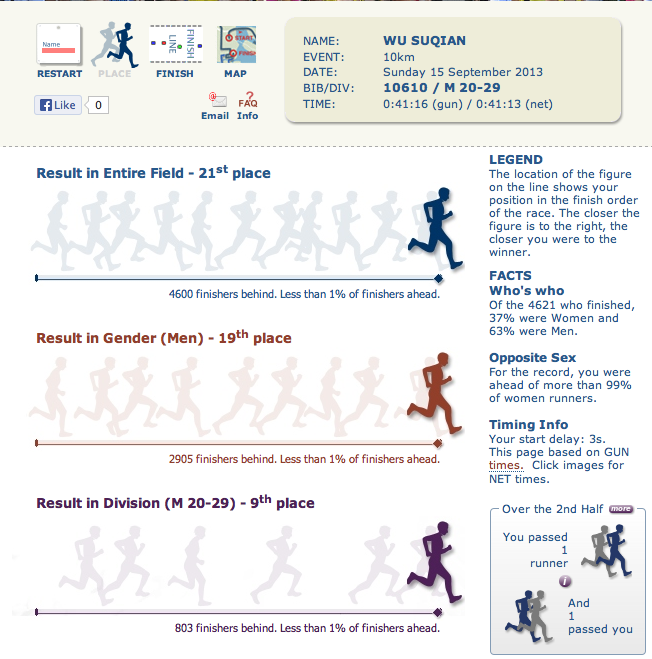 The long term goal is to qualify for Boston, so the next target is to do a SUB1:30 half-marathon. The recent Boston Marathon successful qualifying times are 1min 28secs faster than the criteria. Hence, judging from this trend, I think its safer to be prepared to run a 3:00 marathon in order for Boston qualification. Technically, by a rule of thumb, your full-marathon time should be your half-marathon time x 2 + 10mins(max). If this rule of thumb is anything to go by, then I really should be looking at doing a 1:25 half-marathon. I want to accomplish this in early part of 2014 so I can shift my focus to the full-marathon in the 2nd half of the year. Initially, I shortlisted a couple of races which fell in January or February 2014. 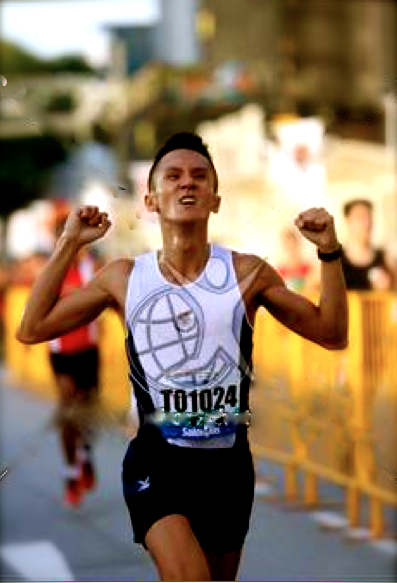 But seeing that I have the 10K Standard Chartered Marathon Singapore to finish in December, I feel that a February race would be perfect. 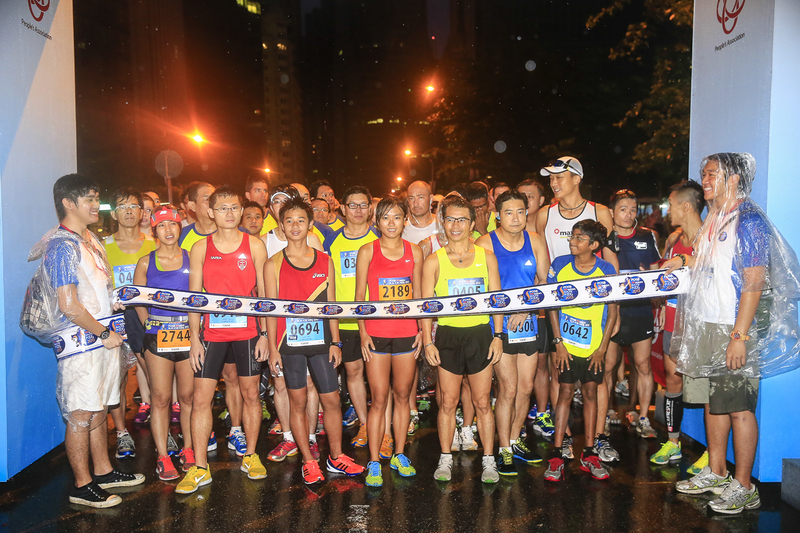 Amongst the big races, two destinations in Asia that feels good would be Tokyo & Hong Kong. Due to the location & not much difference in time, there isn’t a huge need to adjust the body clock. The other perks would be the cool weather in February in both locations. Having been to Tokyo earlier this year, I feel I familiar with the place & would definitely like to return there again. 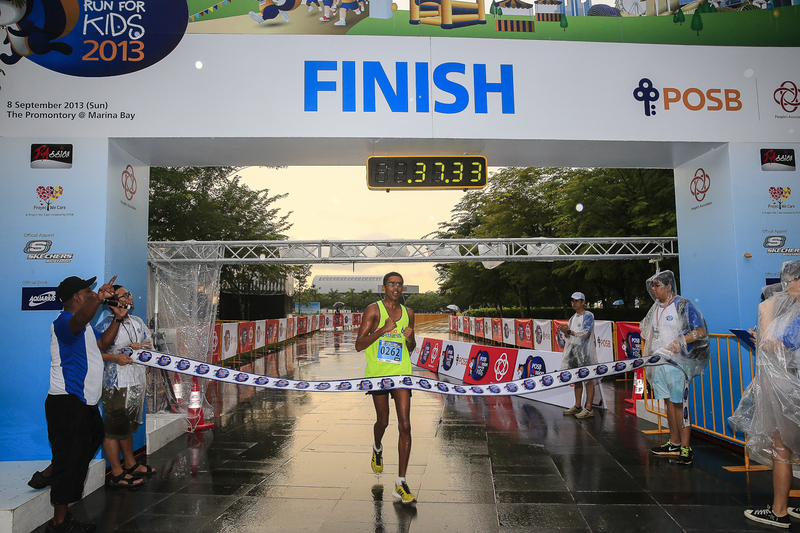 This coupled with the recent promotion of the Tokyo Marathon to become the Sixth World Marathon Major, it is definitely becoming an attractive race to go. 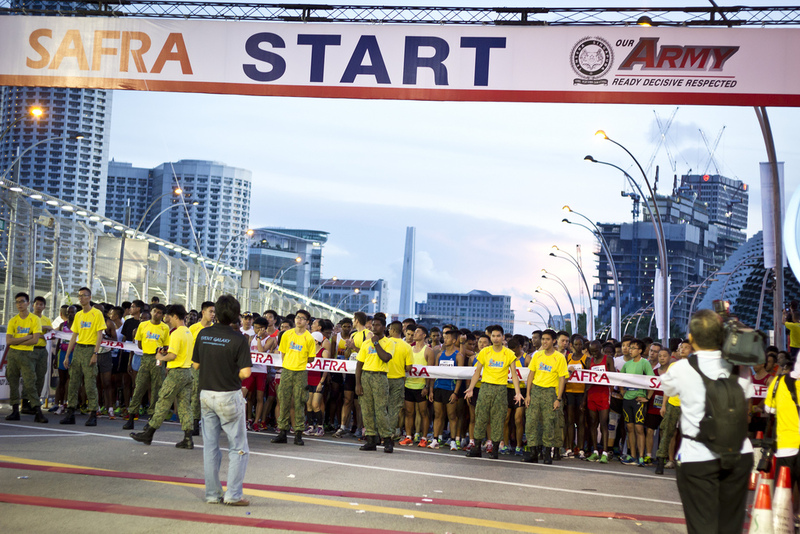 However, due to the limited capacity & popularity of the race, race slots are balloted & allocated by luck. 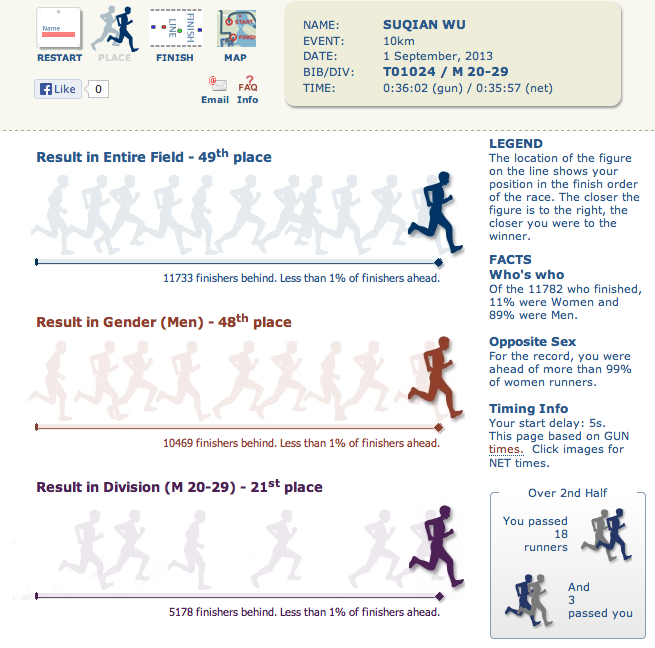 The best part of it, was that it only had the Full Marathon category, making this race ineligible for the criteria. 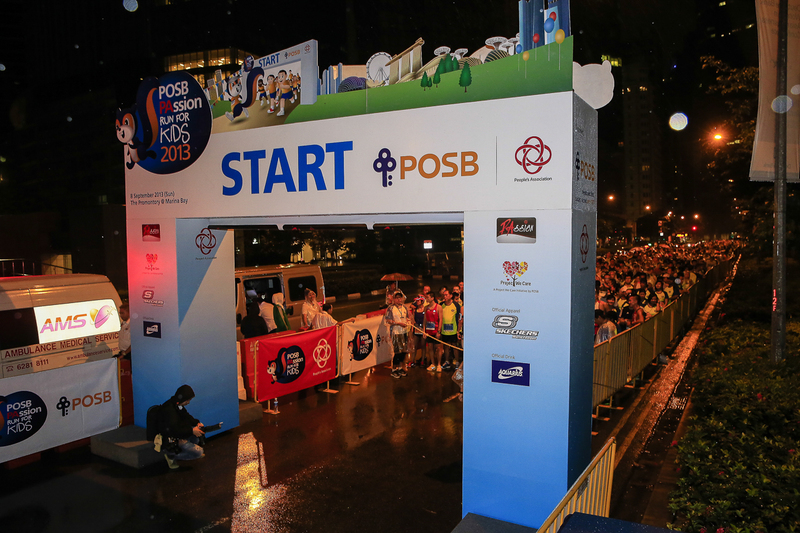 Shifting my focus on Hong Kong, quickly there was a race in mind, the Standard Chartered Hong Kong Marathon (SCHKM). Having been constantly bombarded by race bibs hung in the office & former colleagues talking about the race, it has become an attractive destination for me. The best part is that I have not been to Hong Kong before in my life (yes, I have been living under a rock!) Now I definitely have an agenda for me to go. 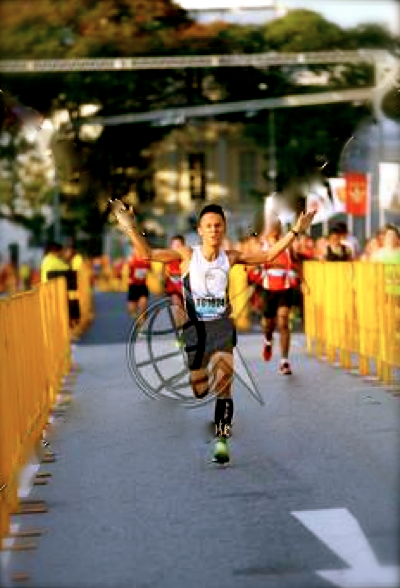 I was looking a smaller race meet in Hong Kong called the Hong Kong Half Marathon, a couple of weeks earlier, but it seems that it is a really hilly course, hence, I have dropped it as a consideration even though the field was much smaller. 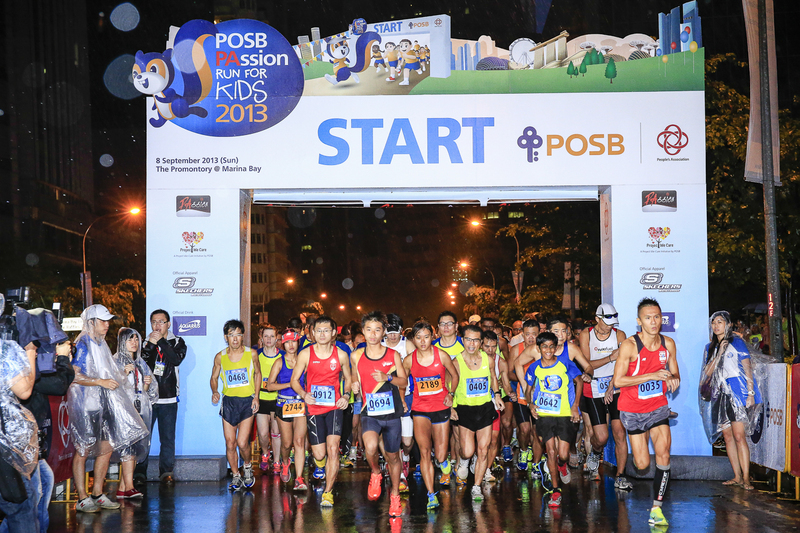 Yes, Standard Chartered Hong Kong Marathon it shall be! 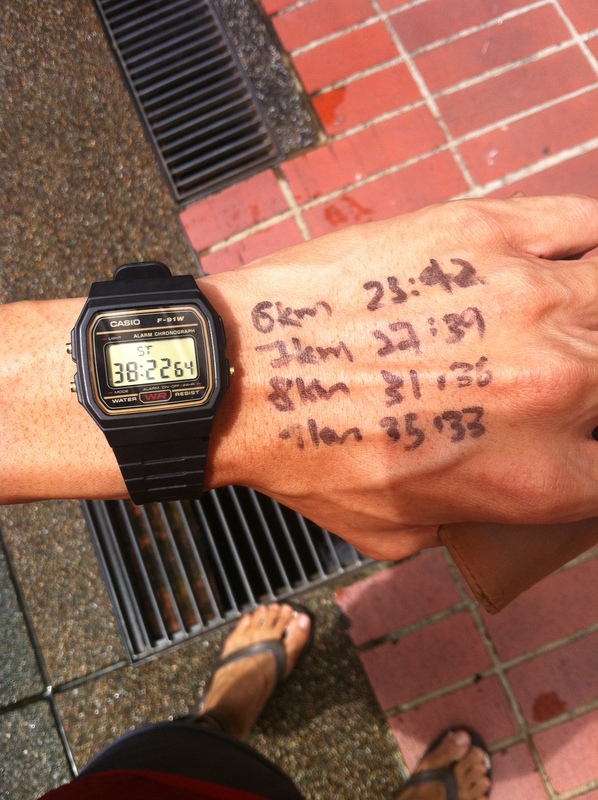 Target race pace: I have a to do a 4min15s/km pace throughout the entire 21km distance. Similarly, this pace would also allow me to get a SUB3hr Full Marathon if closely followed. 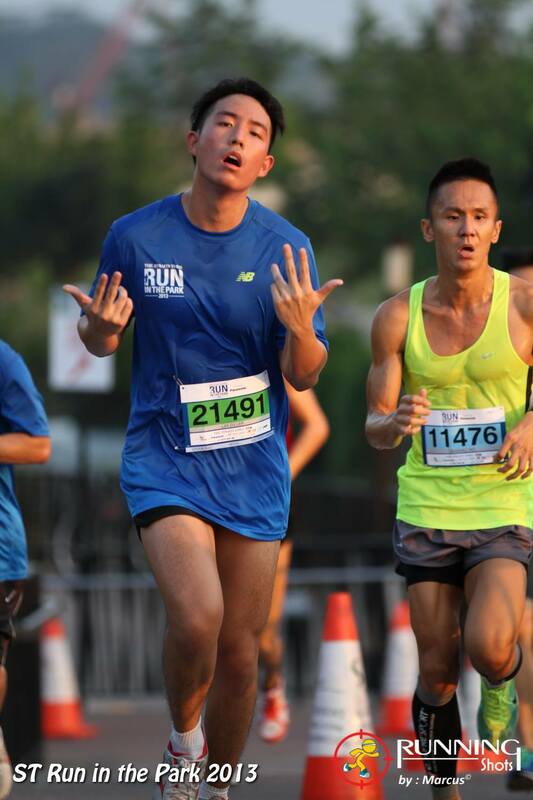 But I know pace seems easy when doing a 10k, but when carried out at HM or FM distance, can you keep this pace consistently? Hence, I definitely think there is much to do going forward. 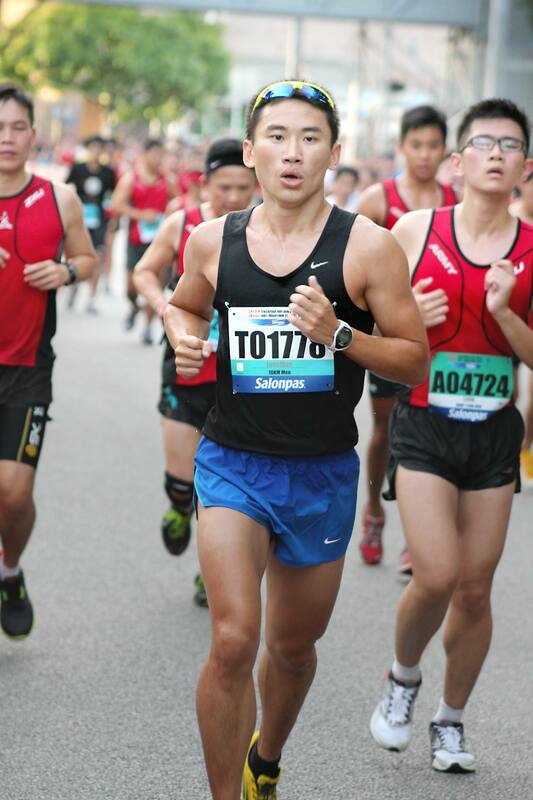 Firstly, for the SCMS 10km race in December, I would be targeting a SUB38min 10km. Secondly, a 8min 2.4km is also on the cards (currently hit a NEW PB 8’22” this past week). I would be racking up the mileage, at much lower intensity as compared to what I have been doing (which are just intervals & short tempo runs). To get to where I need to get, I intend to go on 15-20k Tempo runs, & weekly LSDs of 20-33k at the peak. Basically, a glance at my workload will look like its training for a full-marathon, but I will only execute a half-marathon at the end. This shift of focus on higher mileage at lower intensity is to dial up my aerobic capacity, which will allow me to do a 4m15s/km pace at a seemingly easier time. The third & final thing is to stay injury free. This is key to building up on the hard training that is put in, definitely will be doing everything progressively. I have been focusing a lot on recovery techniques & will share this in the near future. 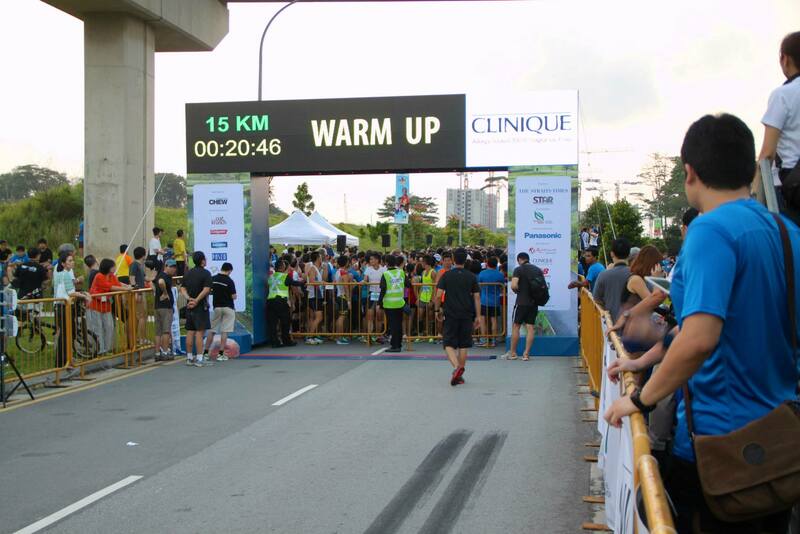 Had a chance to a training clinic put together by Standard Chartered Marathon Singapore last week. 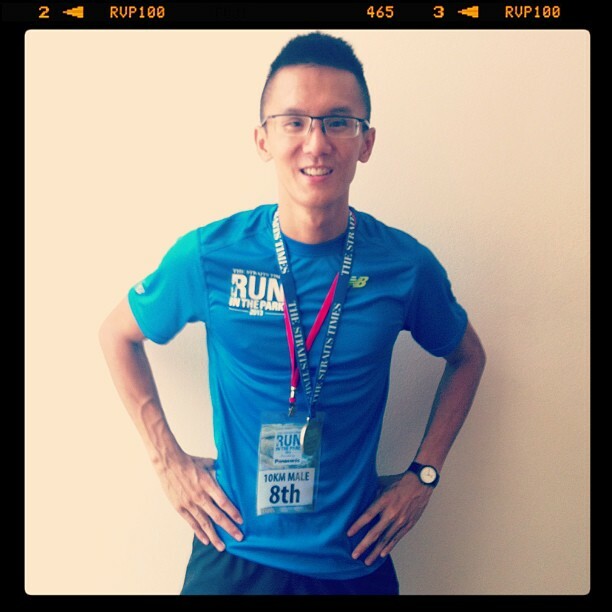 Mok Ying Ren, Singapore’s fastest runner, gave a talk on “Recovery” which I felt was very helpful, & I will be looking to share some insight in the coming weeks. 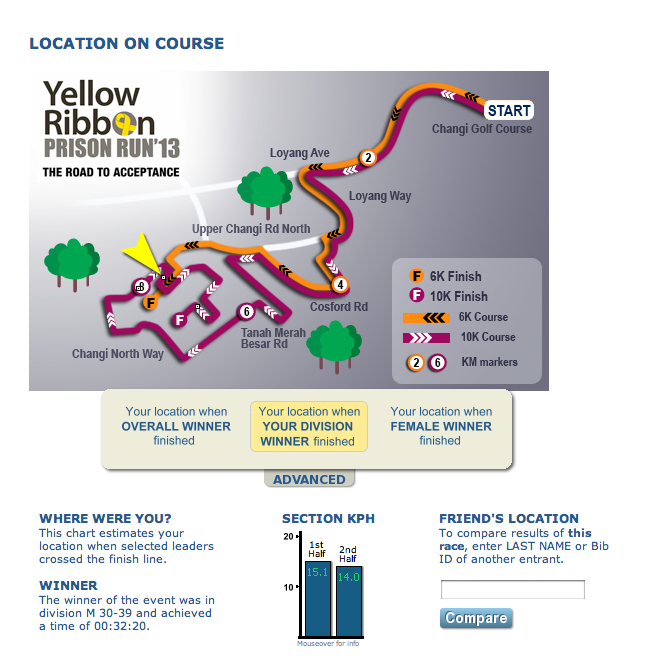 15 September 2013 – I signed up for Yellow Ribbon Prison Run ’13 for the very fact that it would have presented me with a second chance, if I had botched up my SUB40 10k attempt after 5 tries (Jurong Lake Run, KOTR, ST Run, AHM, & POSB). 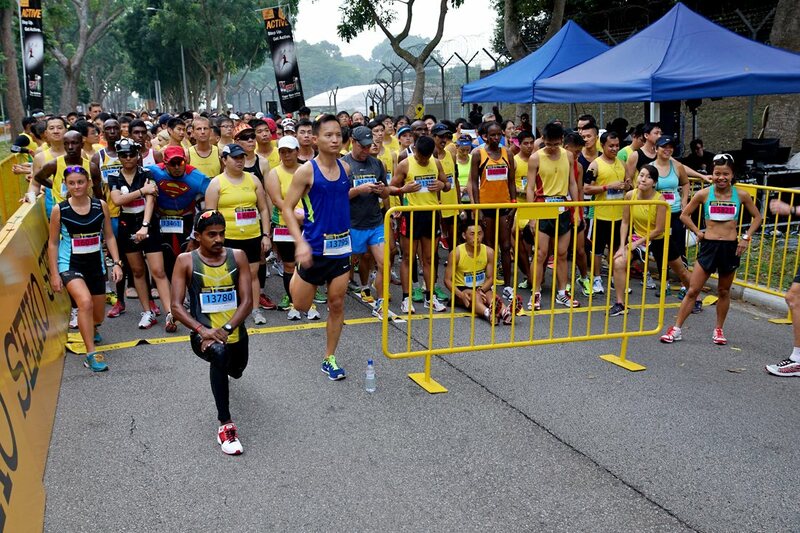 After the POSB run, I had to refocus my energies on training for my IPPT. Yes, you would think that I would have no problems clearing my IPPT, but in actuality, I do. I have never been a talented jumper, & SBJ somehow always manages to present me with a predicament. 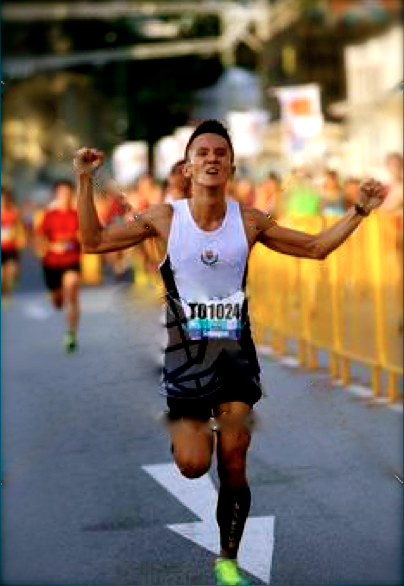 I am not proud to say that I only managed a silver in my midweek attempt in the IPPT, missing the mark by a mere 4cm. But as you know, that 4cm would cost me alot. The $200 extra incentive is nothing compared to the pride of wearing the badge proudly on one’s No.4 uniform knowing that you are of GOLD standard. I pinpoint that problem to having walked too much prior to the IPPT, as I was bringing my tourist friend around Singapore the day before. All the walking had caused my recurring ITB injury to resurface again. I think in the IPPT attempt, I aggravated it further. 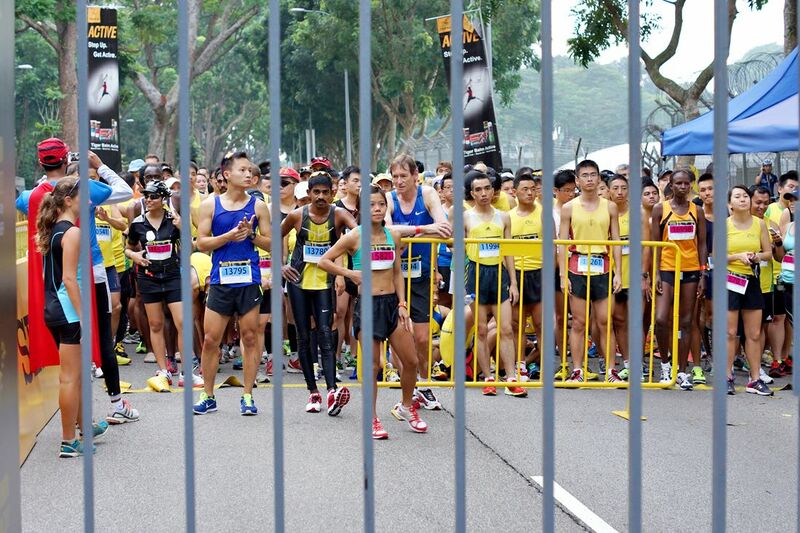 Hence, during the lead up to this race all the way till I was standing at the Start line, I could feel my ITB was still quite tight even after warming up. Before the race, I went in with the mentality of just heading to the Start line & run without pressure, as I already broke my PB & SUB40k goal. During my warmup, could see many Kenyans doing their warmups too, & Gurkhas just hanging out in front. I knew the Kenyans would come in approx. 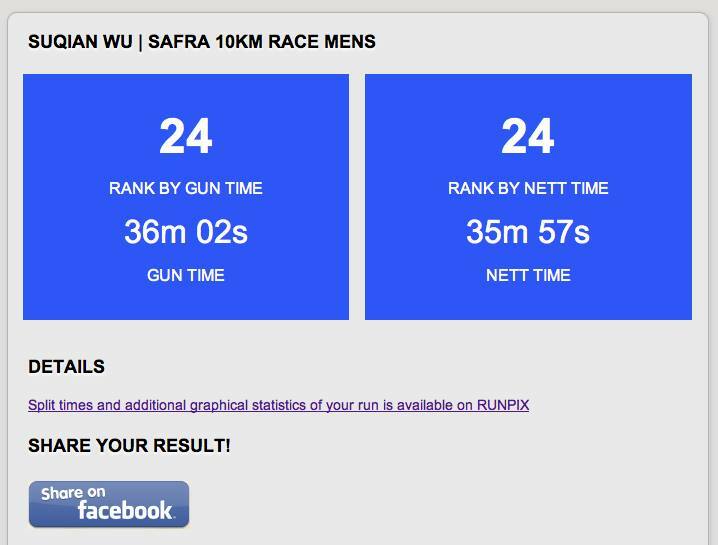 32mins & the Gurkhas in 35mins, so I definitely had no chance of a Top10 finish, which reinforced my notion of not racing for position, rather a risk adverse come-out-in-one-piece mentality. Saw a few familiar faces arriving & doing their warm-ups out in front, which included Ramesh, Vivian Tang, Tony Seakins. 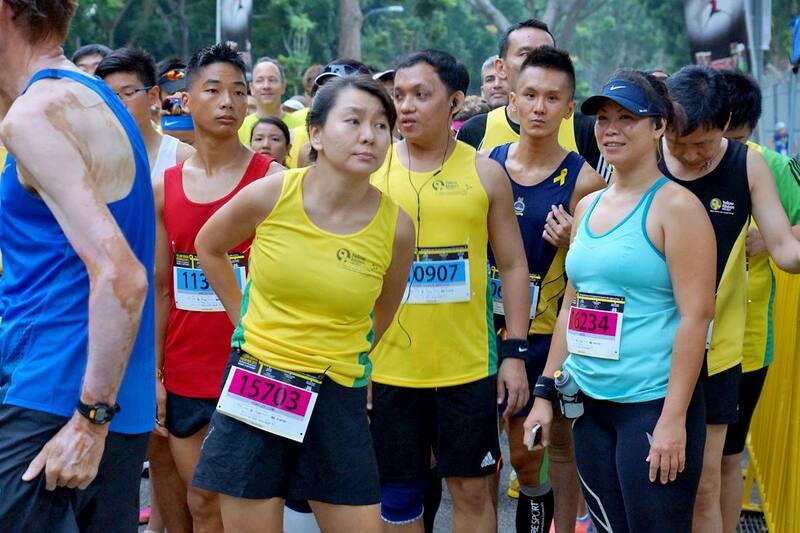 Vivian, whom I ran alongside before in Jurong Lake Run back in July was a welcomed sight as I knew she was always doing SUB40s & seemingly like a pace guide if you want to hit that time. I was lined up in the third row, just behind the Gurkhas, but I knew that I was going to follow my own strategy of starting conservatively & finishing strong. 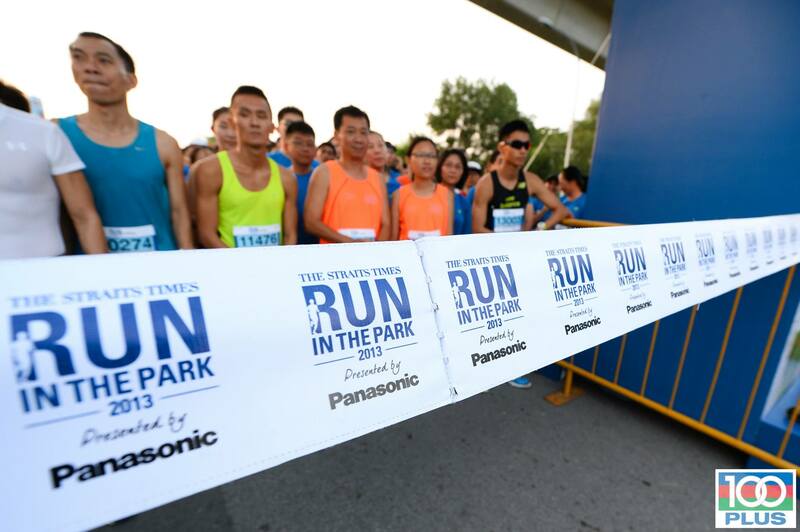 DPM Teo Chee Hean flagged-off the 10km race & immediately there was a fast surge to the front. As I expected, I could see a huge group of fast runners breakaway including the Kenyans & Gurkhas. 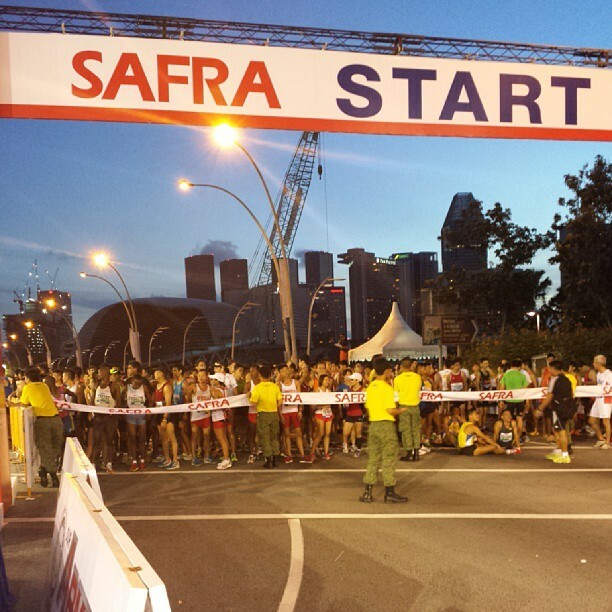 I just ran my own race, starting at a very conservative 3:45min/km in the 1st & 2nd km. 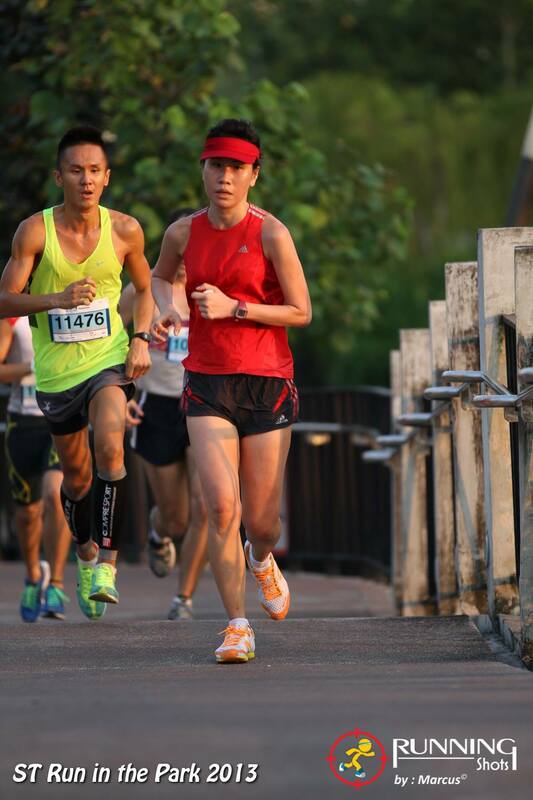 Somehow, I was waiting for Vivian to catch up with me as I knew she would, & she eventually did just after the 2nd km. There is just this sense of safety when you are running with a more experienced runner, especially if you know that you are able to keep up with them. In that moment, I could sense there was an common understanding that we would be able to catch up with her soon. The course was hilly & contouring up & down, making for a very challenging ride. 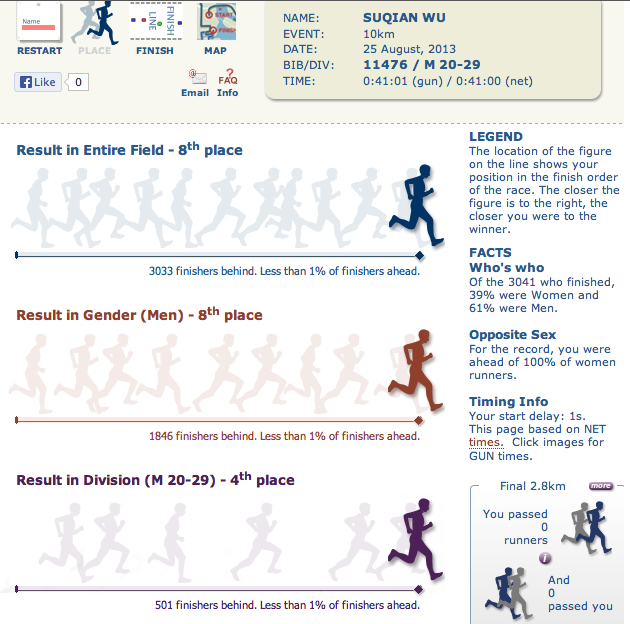 Eventually, after a lot of consistent running, we managed to pass the caucasian lady to become first female. This is when the two made a huge surge, leaving the Caucasian lady & me in the dust. Here I am trying my best to play catchup. After we overtook the Caucasian lady at approximately the 7km mark, I did not feel the urgency to follow the two. The hilly course was taking a toll on my legs & it has been something I have not prepared adequately for. Hence, I eased back a little & just cruised finishing in 41’16”, saving my legs, so I could run another day. Bumped into my secondary school & Boys’ Brigade junior, & wow he has grown so much taller after all these years. has much potential in distance running given his tall frame & long stride length. Congrats on your recent AHM PB, CKM! Bumped into my former trainee from NS. 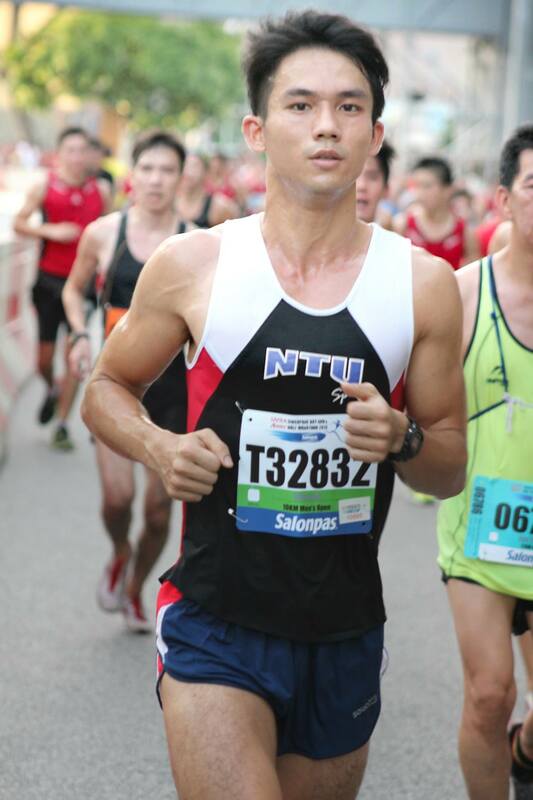 good to see him still running after so many years, he recently clocked a 9’09” PB for his 2.4km. 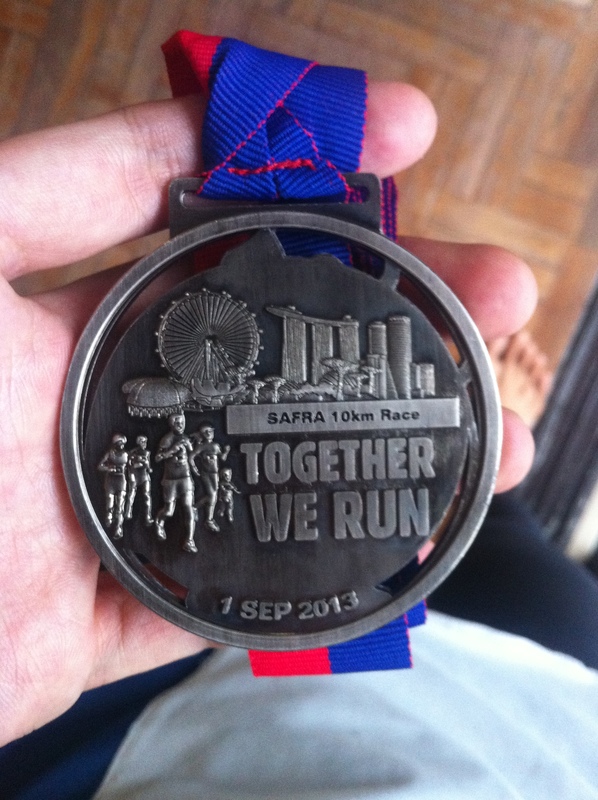 happens that both of us represented Team SAFSA for the JP Morgan Corporate Challenge 2010. Good to see you Johnatton! 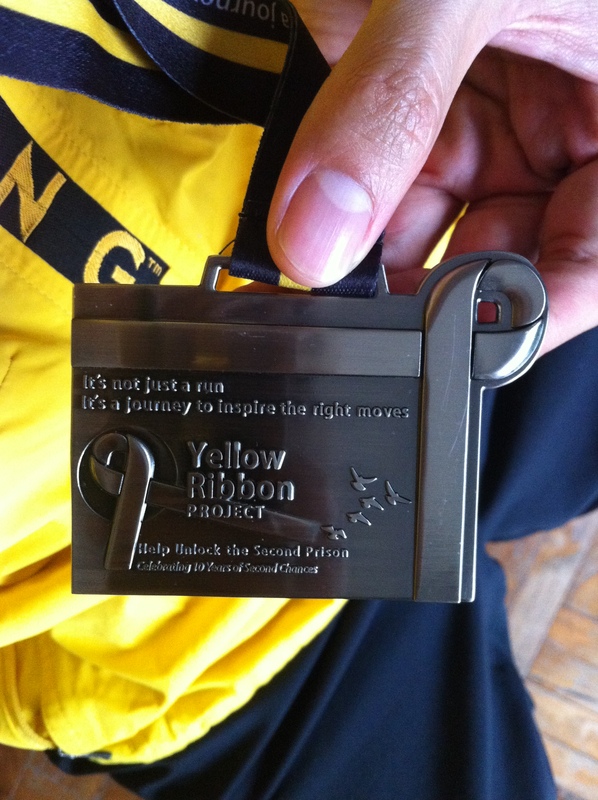 There is no differentiation between finishers of both categories, all finishers received the same medal, but you know what, it doesn’t really matter because everyone that finished today finished for a good cause & are all winners in their own right! Super hilly course on this awesome sunday morning, great support along the route, superb organisation & staff & volunteers here at Yellow Ribbon Run’13. here’s to 2nd chances! 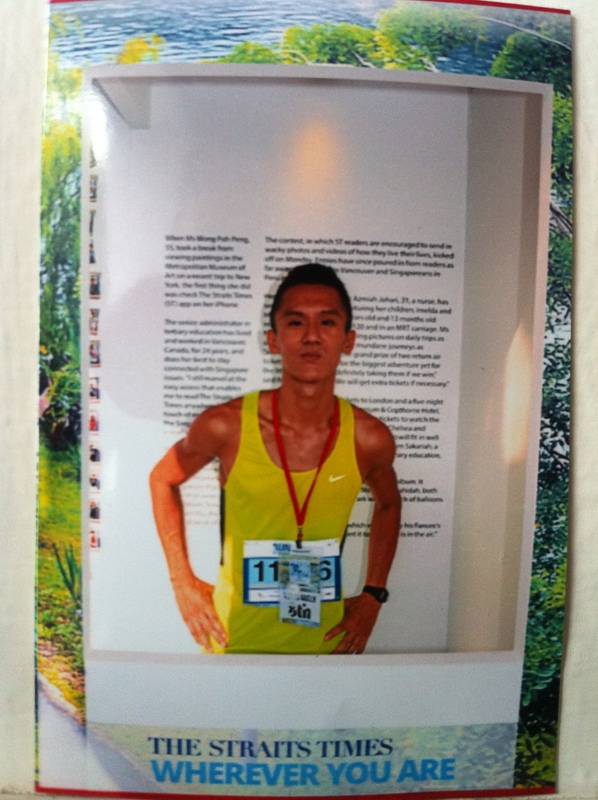 To be honest, I am quite relieved that these bout of races are over & I managed to secure my time goal of a SUB40 10k. Going to have a much longer post later in the week about a summary of these races & how I look moving forward. Something to note is I tend to perform better with a Banana & energy drink breakfast, rather than an museli cereal breakfast. 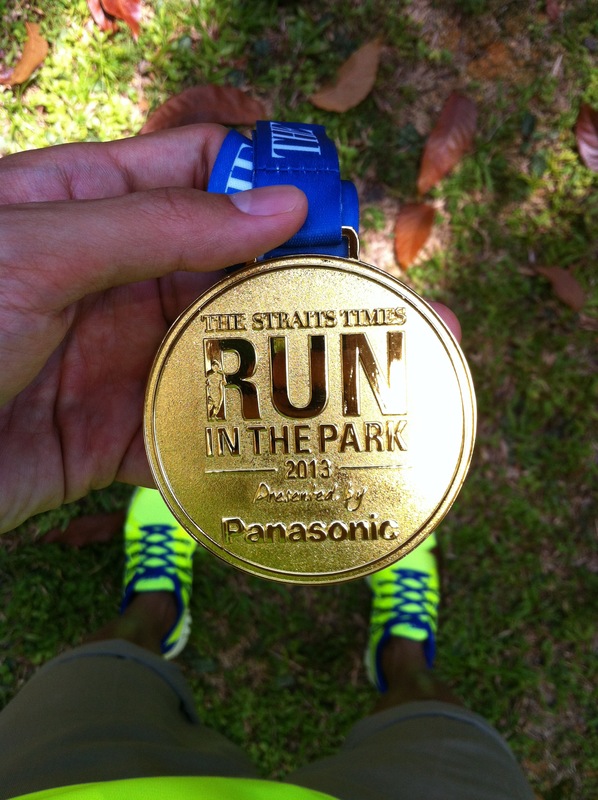 Still have to get that GOLD for my IPPT, before starting to build up mileage to tackle a new goal time-distance. I also feel that I need to work on my anaerobic ability again as I feel I am losing speed over shorter distances. We have a good rest in the upcoming week before starting to train for the next bout of races in Nov-Feb.
As mentioned, the course is really hilly & it had many ups and downs. Some of the U-turns were going down hill, & immediately going the opposite direction, & that is uphill! It is definitely not a course if you want to set a new PB. 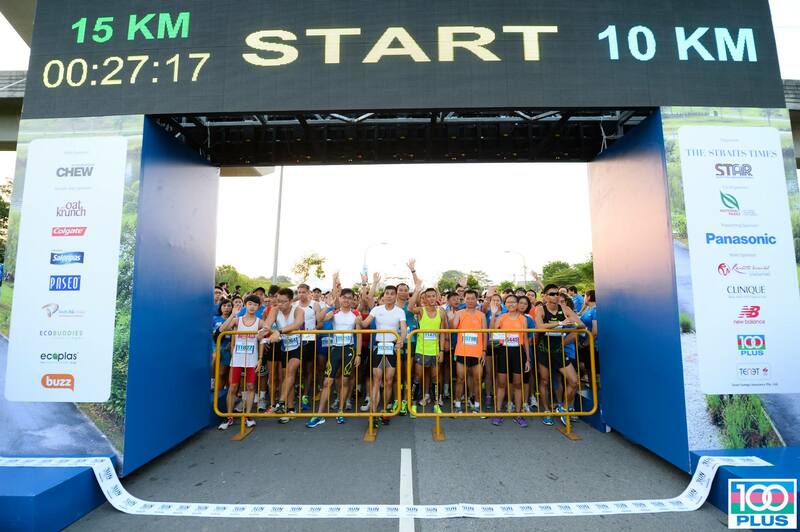 The 10km race starts at 0745hrs, which is rather late, & if not for an overcast morning, it would have been really hot during the run. 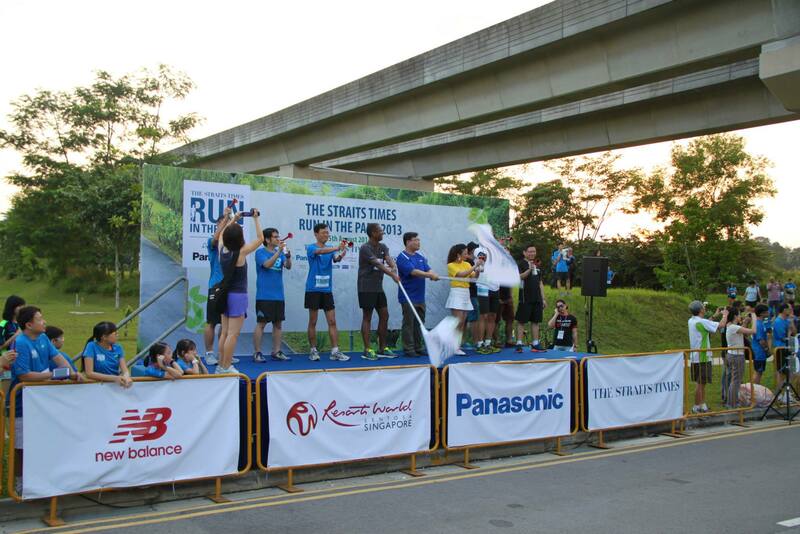 But the on course volunteers are really enthusiastic, cheering & trading high-5s with runners. 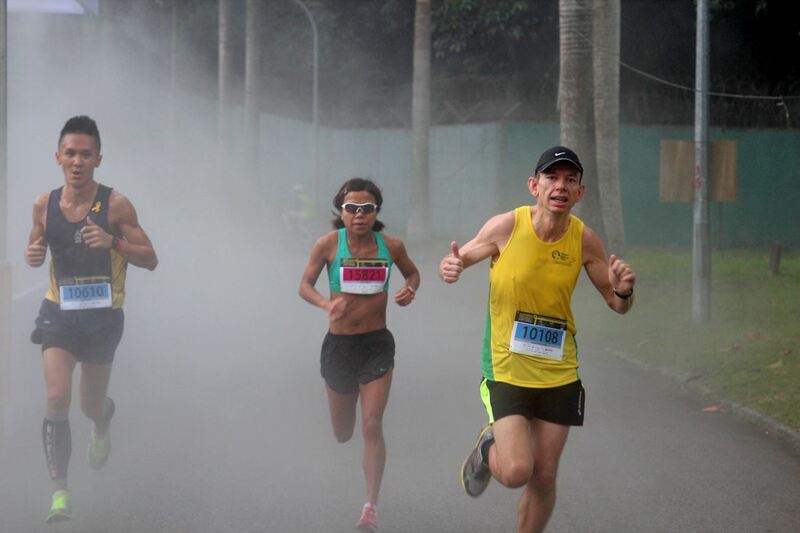 Also enjoyed the mist area after a major uphill in the course, a welcomed cool relief. 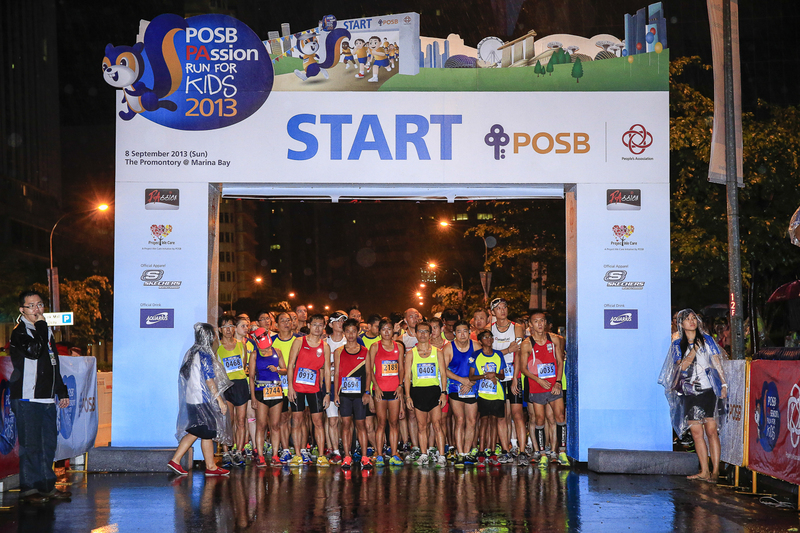 8 September 2013 – It was pouring throughout the last few days leading up to this race, & it continued to do so even on the event morning itself. I woke up at 0430hrs, had breakfast while contemplating whether or not to go, after the disappointment at the cancellation of KOTR last month due to inclement weather. At 0500hrs, accessed the weather, & felt that the rain has subsided alot, hence, changed & left the house. Drove to race site & parked at Wilson Parking, close to the Marina Promontory, surprised that there was plenty of space when I got there. Was surprised to find the start pen empty even at 0605hrs. Must have been the weather, everyone was hiding under the tents. 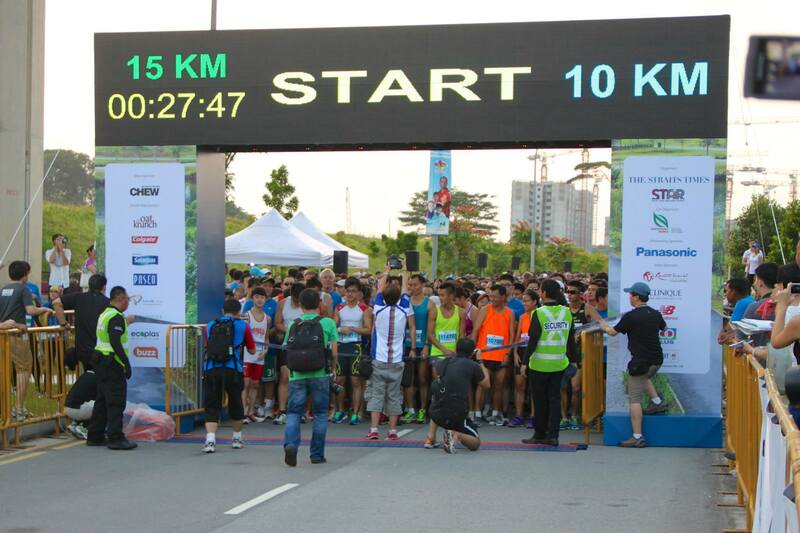 I did some strides & headed to the start as soon as the Emcee announced for 10km runners to gather there. 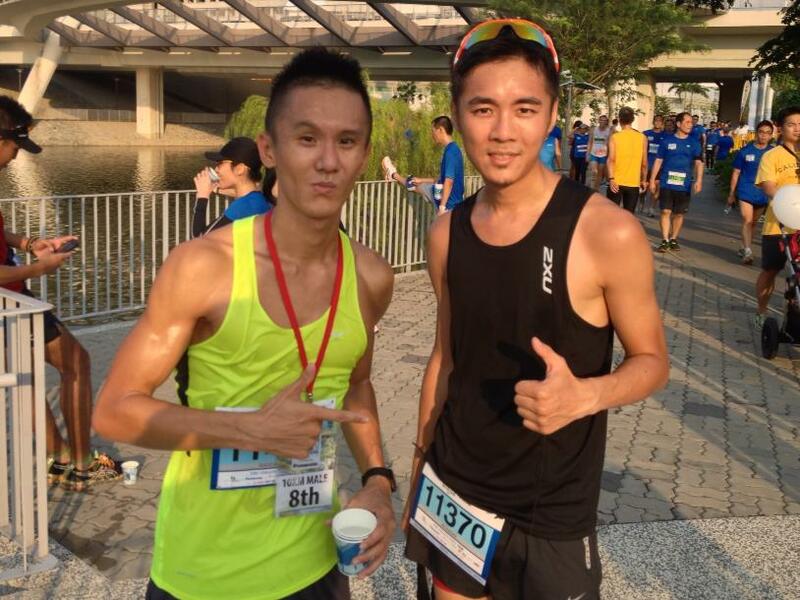 having a chat with fellow ST Run in the Park runner, Ronnie Teo. He shared with me that he did a 22km LSD the day before, so legs were not 100%. I asked Ronnie to start up front, but he didn’t want to, so I just went to cover up the gap. Was not my original plan to be on the tape after a successful outing at AHM, where I was three rows behind the front runners. 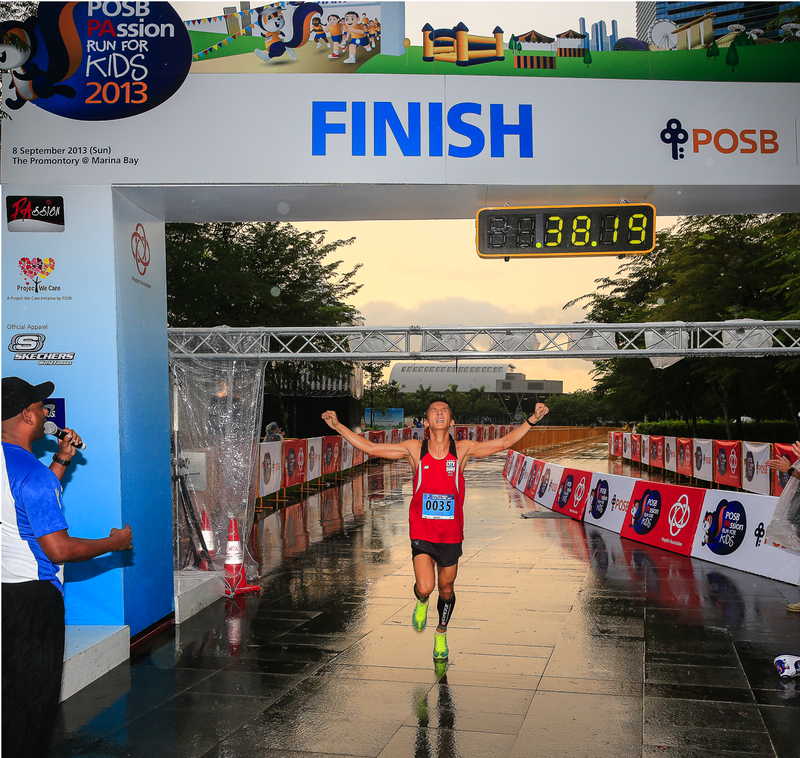 Mok Ying Rong, who eventually came in first for the Women’s Open Category was among the 10km field. 3,2,1 GO! off we go! 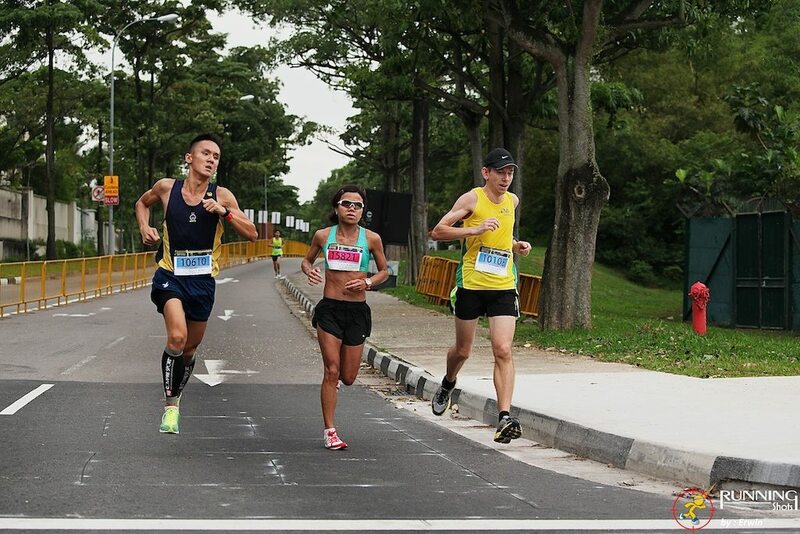 just coming into the 3km mark, about to cross the Marina Barrage to Gardens by The Bay(East).Can see eventual winner just behind me at the point of time, he overtakes at 5.5km mark & basically wins by huge margin. 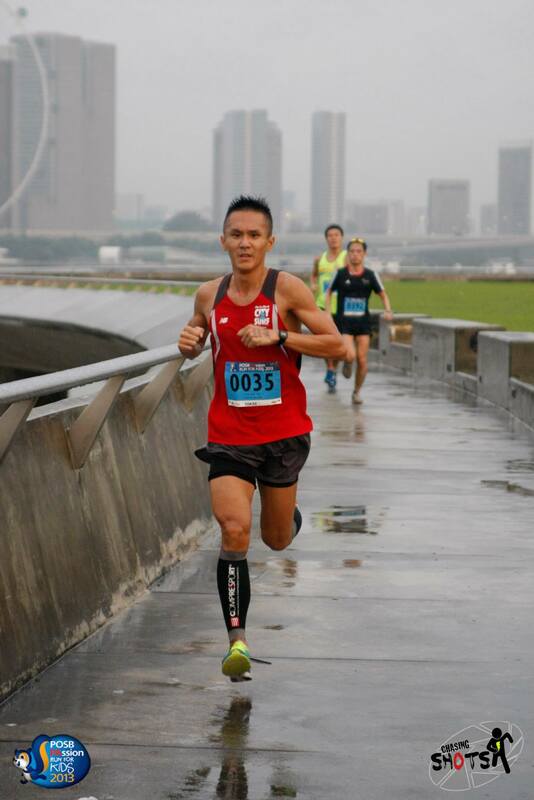 coming up the Marina Barrage after the 6km mark, skipped the water point just before coming up as I was feeling reflux. 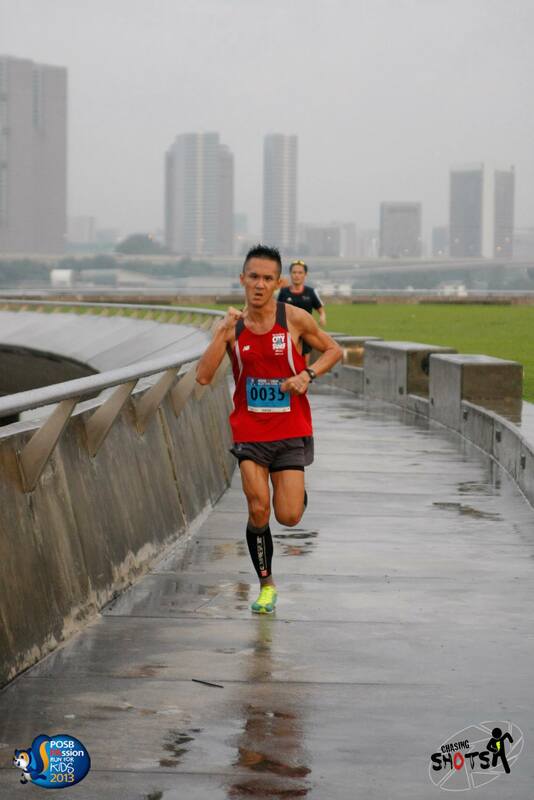 at this point I was half dying till I saw Mr. Chasing Shots disappear & reappear at the top of Marina Barrage, sitting on field chair, camping under his camo net(umbrella) & rifle(camera) in hand like a sniper, suddenly got motivation to run, cannot let the man down, after he brave the rain for us runners. so the two very fast marathoners were using this race as training, Ronnie who finished London Marathon in 3hrs, & did 22km LSD the day before, & Thow Wee that finished Gold Coast Airport Marathon ’13 in 2hrs 53mins. stress!coming down the barrage, I turned to muscle memory dig into to the hill training I did previously, going up the hill & sprinting all out down hill without gassing out. 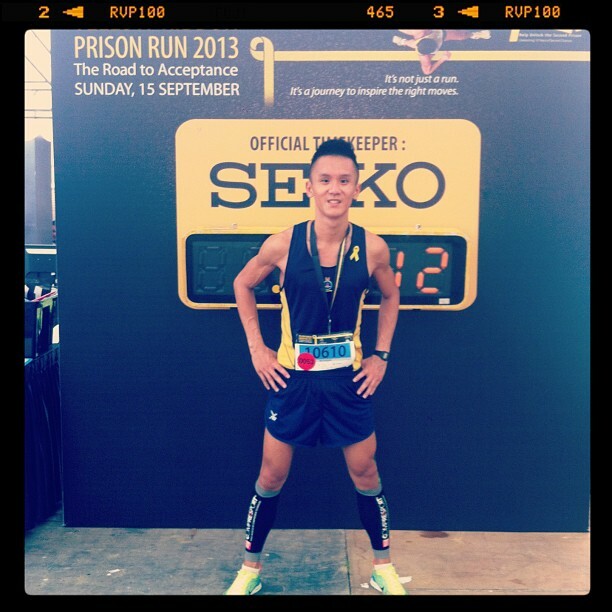 after the race, found out he is from Guards fmn, & was school team runner before, congrats Jeevaneesh! the face says it all. all these months of hard work has paid off! SUB40 10k! Well done, Ronnie! Impressive even after 22km LSD, still managed to fire legs. I swear trying to write your details down right after a run is no joke. 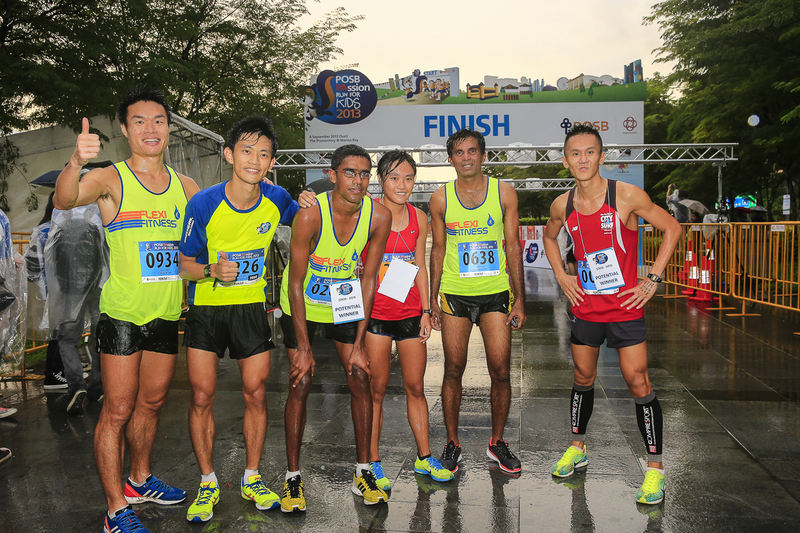 Group photo with some fast runners, including Singapore Marathon record holder Rameshon, GCAM 4th Singaporean, Lim Thow Wee, Mok Ying Rong, & Winner, Jeevanesh. 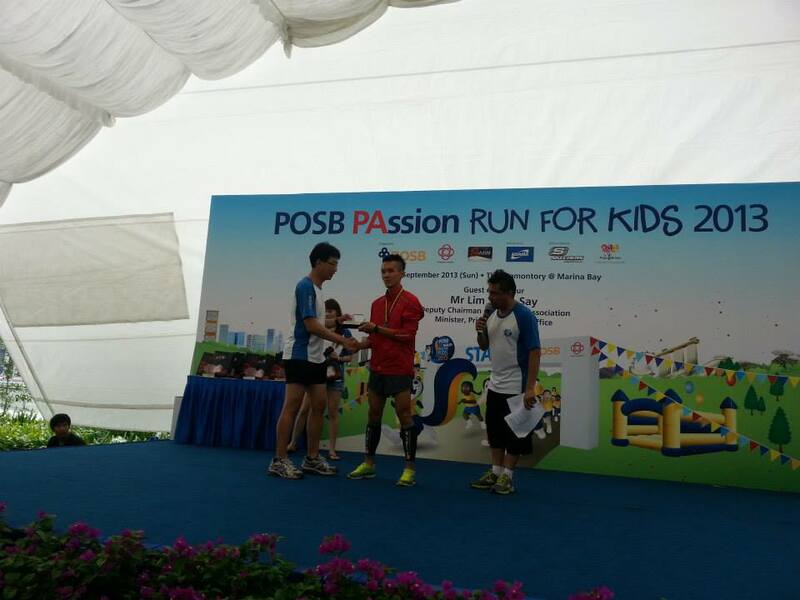 First podium finish, a little bit nervous to be going up on stage to receive prize from People’s Association(PA)’s Chief Executive Director, Mr. Ang Hak Seng. wonder if I can really chase a squirrel now. saw some at MR recently, but they are too fast. hope can use this to inspire my kids(if I ever have any) in the future! Coming into this race, I was determined to prove that the false accomplishment at AHM was no fluke. So I had set the target time to 39:00 in order to have a 1min buffer. 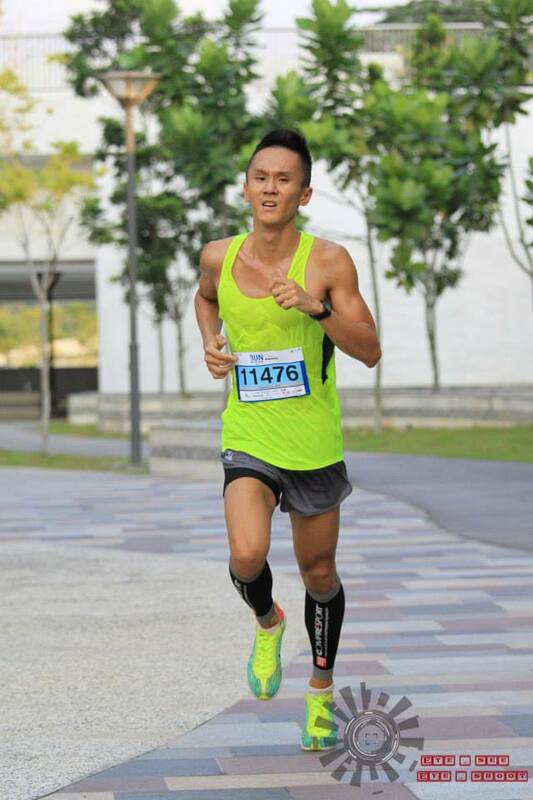 I started the way I always start if I was on the tape, take the lead first, somehow cannot curb natural instinct.Found myself running next to Mok Ying Rong & was doing a 3:48/km or 3:58/km time for the first Km. Yes, I could not see the digits on my watch because it was so dark! Settled into this rhythm, & felt really comfortable, like I would be able to carry on like this all throughout. 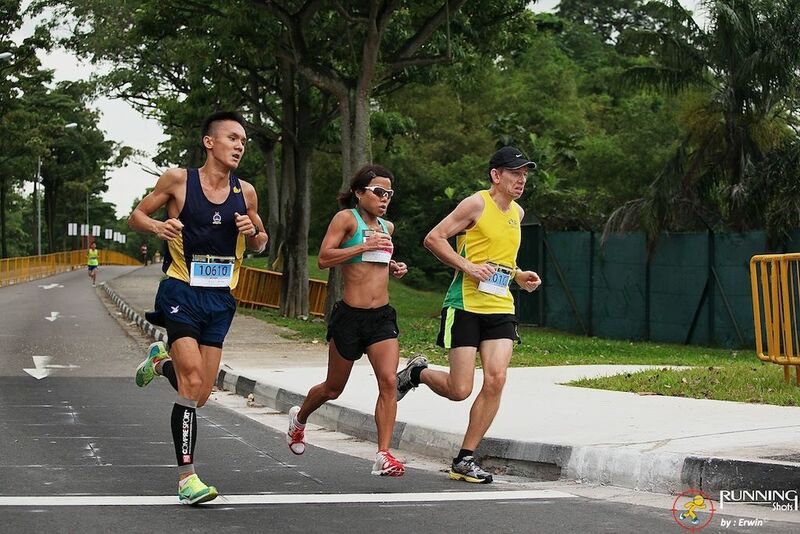 Coming into the Marina Barrage at 3km mark, heard some footsteps behind, hence had to break away from Ying Rong to defend the lead. Held on to this lead till apprx the 5.5km mark when could not match the long strides from Jeevanesh, had to slow down & let him go. 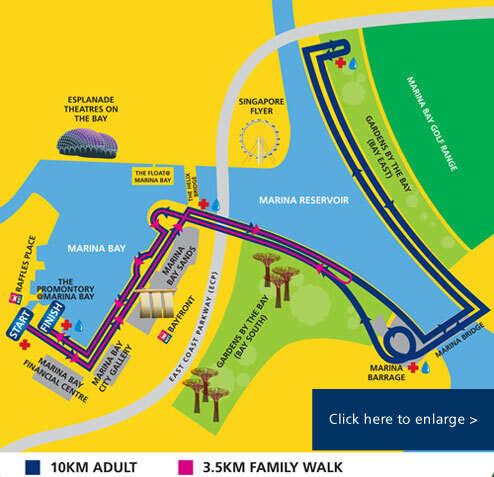 Was thinking of taking a cup of water before heading up the Marina Barrage, but my stomach told me otherwise. Guess, I made the right choice as I felt like puking. 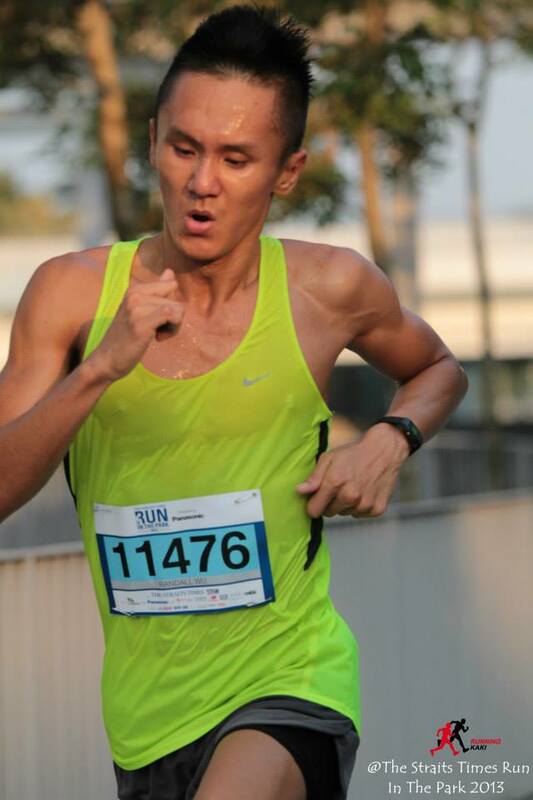 Soon as I climbed the Marina Barrage, saw Jeevanesh coming down the opposite sight, & that was the last time I saw him. 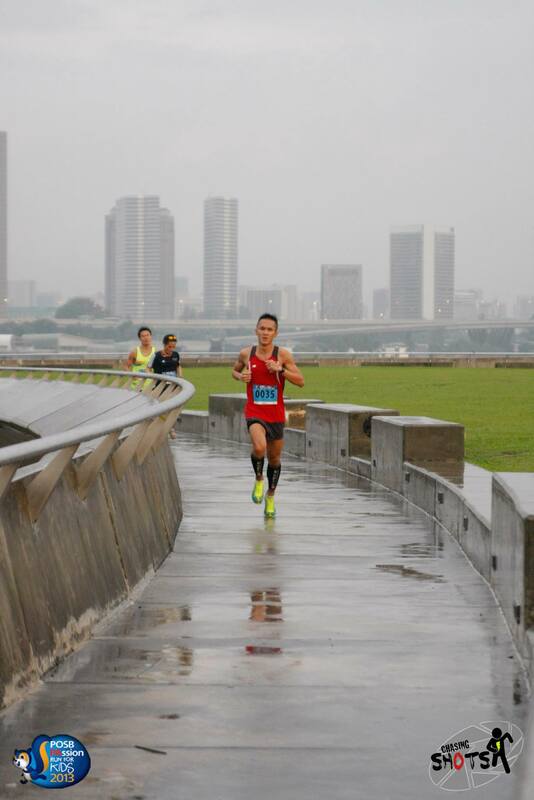 I felt footsteps closing in on me halfway towards the top, & decided to take a sprint down the Marina Barrage. This was something I have been practicing at MacRitichie reservoir in the past few months. At the flower domes, a caucasian runner suddenly jogged next to me & asked if he could run with me, I told him, sure why not? 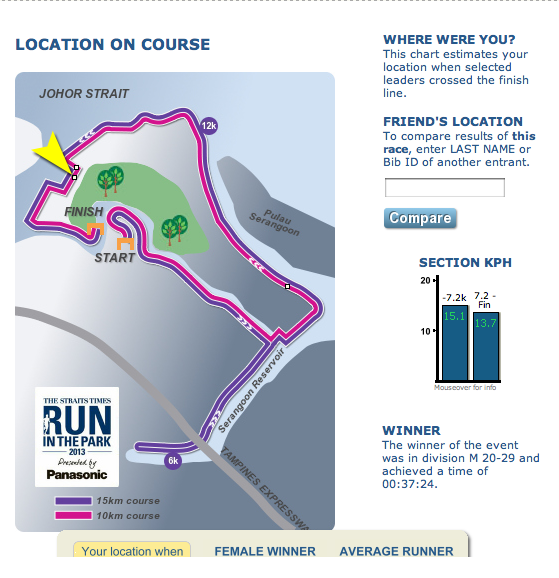 I knew that if one of the runners behind overtake me, somehow I would slow down from previous experience, so I guess it would been good if I had some company down this last 2+km.Decided to skip the waterpoint under the Helix bridge too as I felt like Ronnie & Thow Wee was too close for comfort. I even saw them as I was going down the U-turn towards the MBS boardwalk. Talk about pressure! Would like to thank the caucasian runner for all the motivation, he was tell me stuff like “Good pace” “let’s go, don’t slow down now” “that’s the way!” I was literally running my guts out in the last 2km, constantly increasing speed as I approached the FINISH. 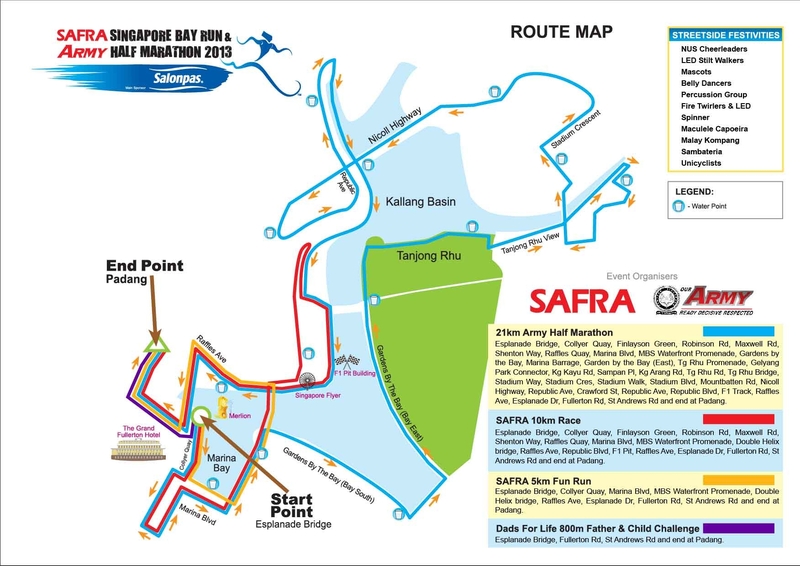 Very straight forward, flat course, except for the Marina Barrage. Please include some hill training if you want to conquer the Barrage without a hitch. Tricky double U-turns right after coming under the Helix Bridge, transiting to the MBS Boardwalk area. 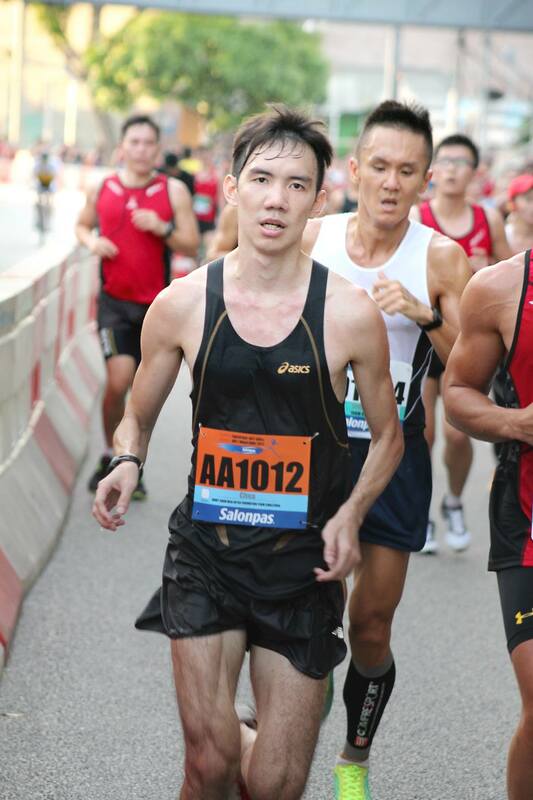 1 September – This was the second of five 10km races I signed up for in consecutive weeks in hope that I would peak in this period & break the SUB40 10k goal. I went to bed at 2100hrs, & woke up at 1200hrs, tossed & turned in bed till 0330hrs, before deciding to wake up & have a light cereal breakfast since I couldn’t sleep anyways. Left the house at 0445hrs & took a taxi, wanted to alight at Raffles Hotel, after I determined that’s the best location to drop. 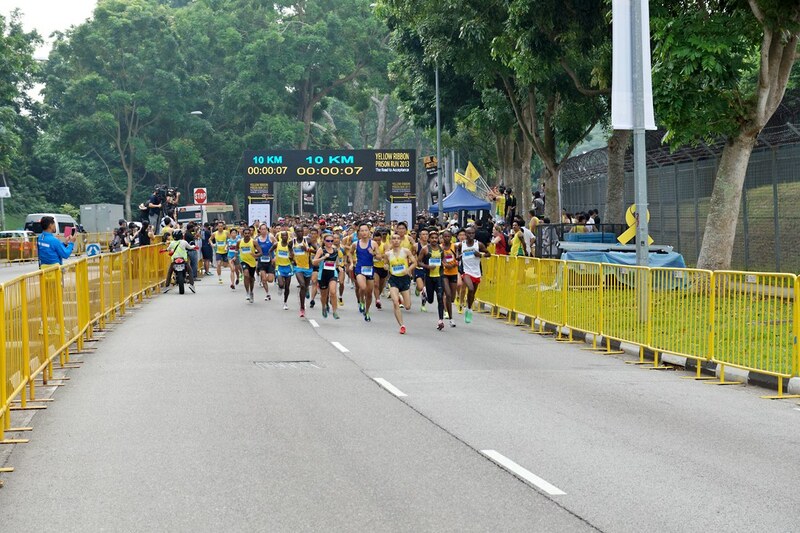 But the entire Bras Basah road was jammed from the cars that were going for the 21km race, so I decided to alight by the side of the road & walk towards the race site. Headed to deposit my race pack & saw some familiar faces there. 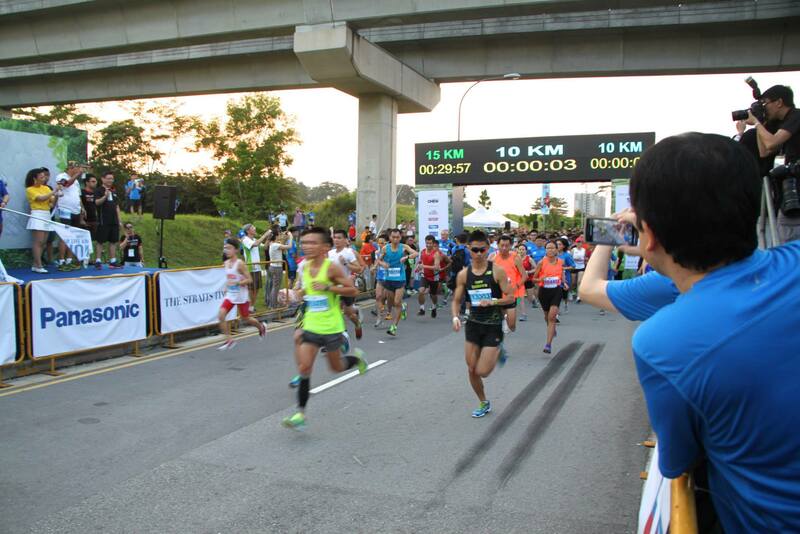 After depositing my baggage, heard the 21km race flag-off. Decided to do some light warm ups & recce the finishing route. 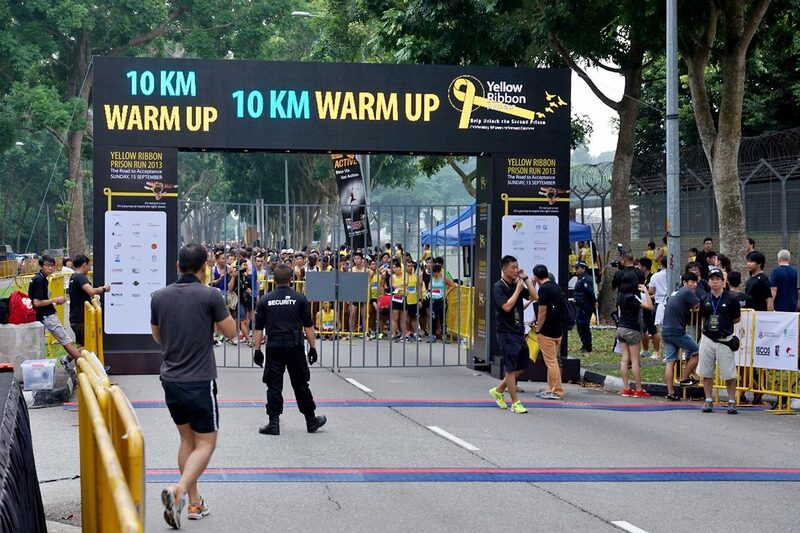 In hindsight, I should have come much later as the Emcee at the race site did not announce for 10km runners to gather till approximately 0600hrs & there was not many people at the start line either when I reached there. After finishing my warm-ups, I found a spot on the right of the start pen, two rows behind the front pack. 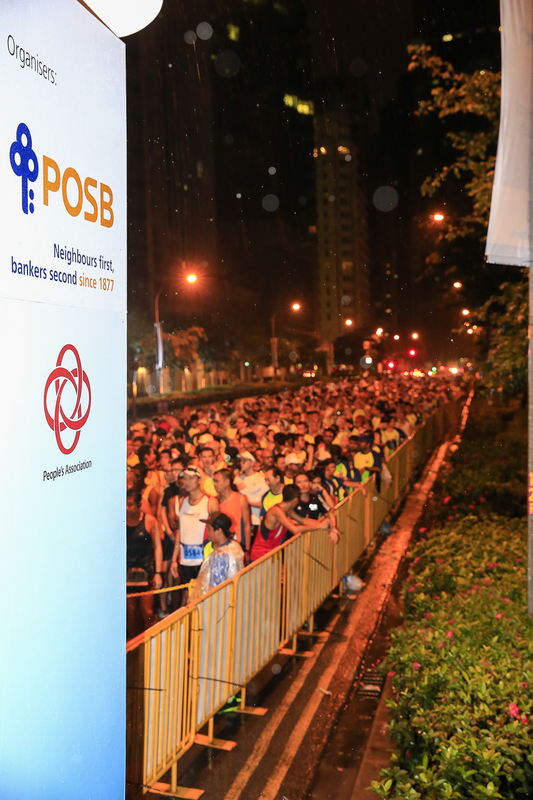 We were watching the 21km runners zoom down to the FINISH in spectacular fashion, & this was way before the sun had risen, way to beat the heat! 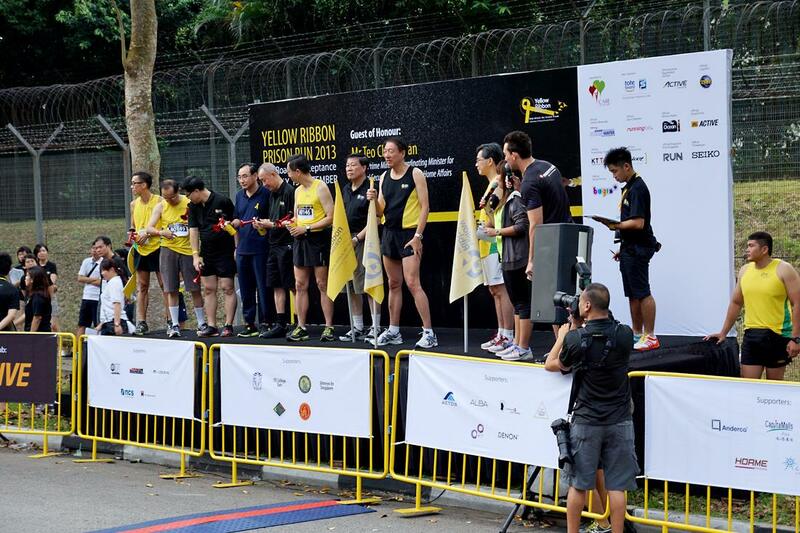 Minister Chan Chun Seng, was the Guest-of-Honour to flag off the 10km race. We had the army boys line-up at the start & had to sprint to the sides when the race commence, makes for a good photo, but quite hazardous if one of them falls during the initial jostle. 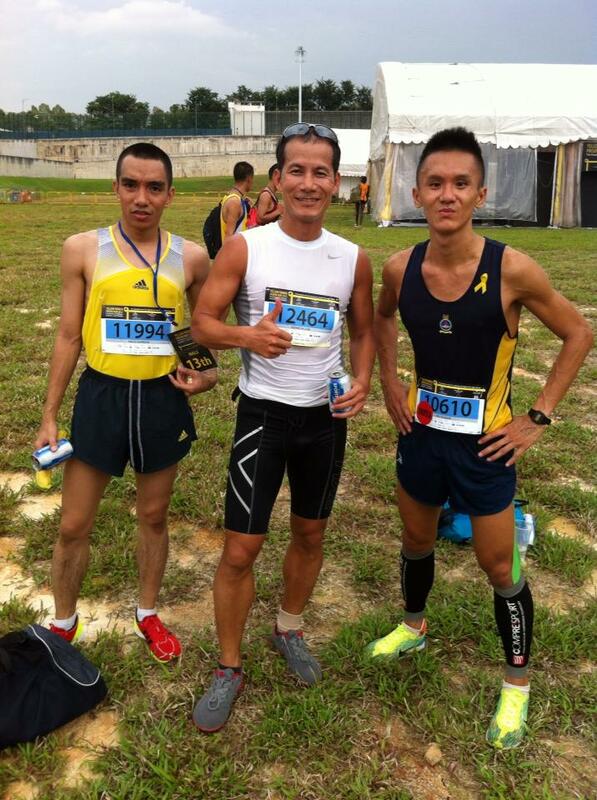 Was following these 3 guys from the 6th km onwards. A pack of us had to shout our way through the crowd on the right after the 10km U-Turn point, which converges with the 21km runners. This was after turning left into Esplanade bridge. Surprised to be in the same picture as my SAFTI & OCS Sergeant Major (2nd from Left). Really respect him as an Encik, definitely made our final days as a cadet very memorable. Some of the Finishing photos coming down the long straight at St. Andrews Road to the FINISH. Another one to add to the collection. Reflection: After a disastrous performance at ST Run in the Park in the previous week, I decided to implement some Pyramid Intervals to simulate race day conditions. In addition, after reading Gold Coast Airport Marathon ’13 local SUB3hr marathoner, Derek Li’s Operation Clam Chowder, I decided to up the mileage to do twice daily runs. I am starting out with 5km runs, with intention to up the mileage as I train for my half-marathon early next year. As I was coming down Esplanade Bridge, I knew I had alot of time in hand, was very happy, & didn’t think much of the superb timing. I still believed it was true as I shouted at the FINISH line & high5 fellow runners & volunteers. 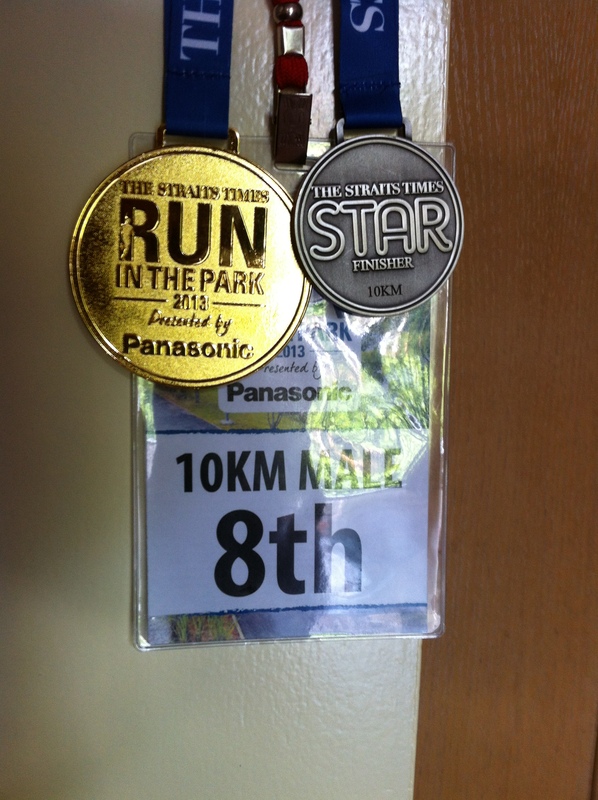 But subsequently, it would be known to me that the race was at least 900m short of 10km. Hence, as the actual race distance is debatable, I do not actually want to consider this a SUB40 10k, even though with time added on, I am still bang on the money. I have 2 more races to ensure that this is not a false accomplishment & total fluke. 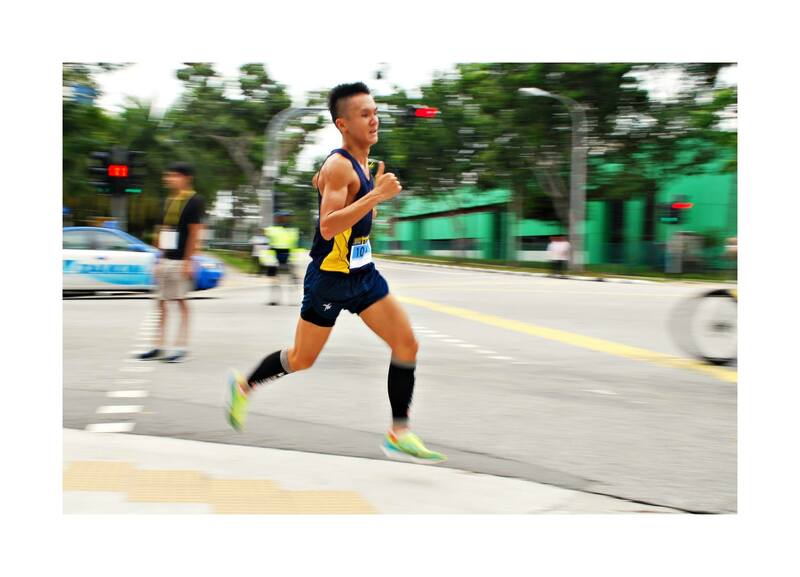 I worked on the things that I did wrongly in the previous race, & ironed out the chinks in the armour. Changed the tights & it worked, & started out 2 rows behind the front pack, & wasn’t totally sucked into the super fast pace, was starting to overtake runners from 5th km onwards, a sign that this race strategy is good. 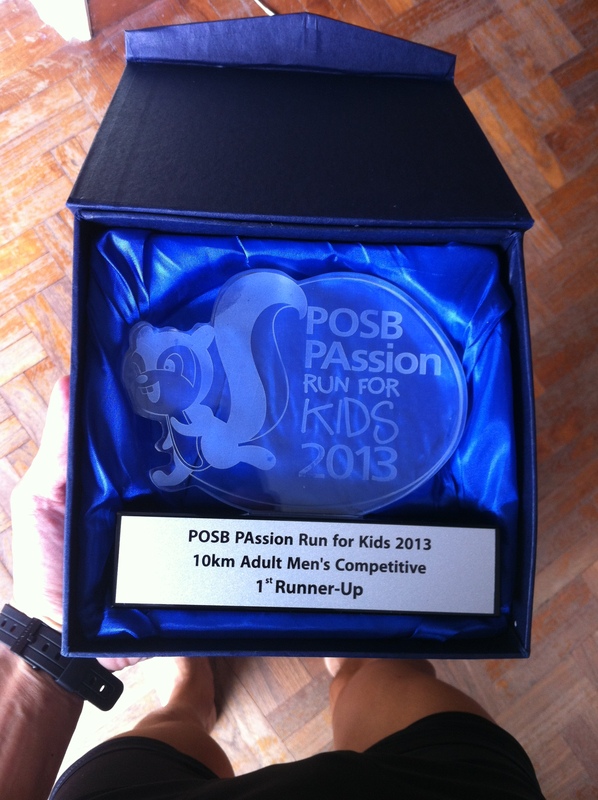 The next two races would just be a repeat of this race, still trying to immortalize that 10km with a proper distance. 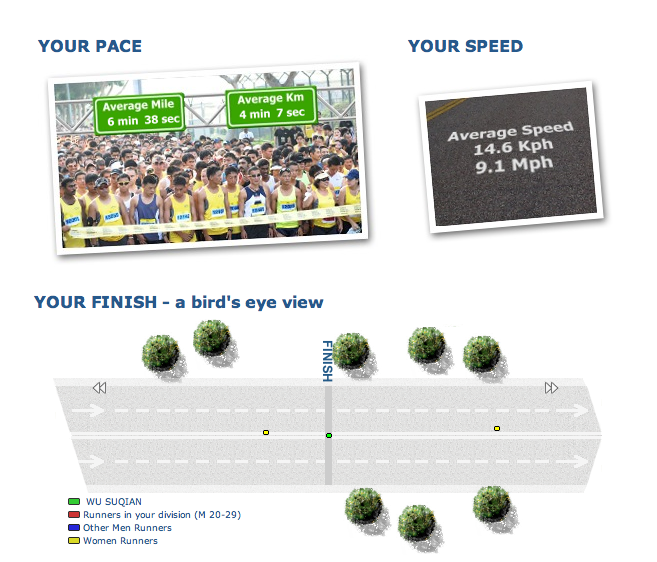 Race Course Advice: The course is at least 900m shorter than 10km. For 21km, its 600m shorter. Hence, almost all the runners I’ve met got a PB today. But that’s really up for discussion. The race passes through the actual helix bridge which I was really surprised given the fact that there was so many runners today. I thought they were going to use the adjacent bridge on its right. Hence, be ready to climb some stairs going up to the Helix bridge. 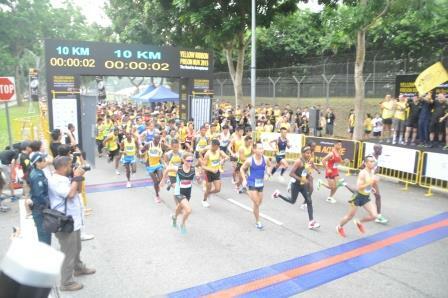 The choke point was at the 10km U-turn converging with the 21km runners. 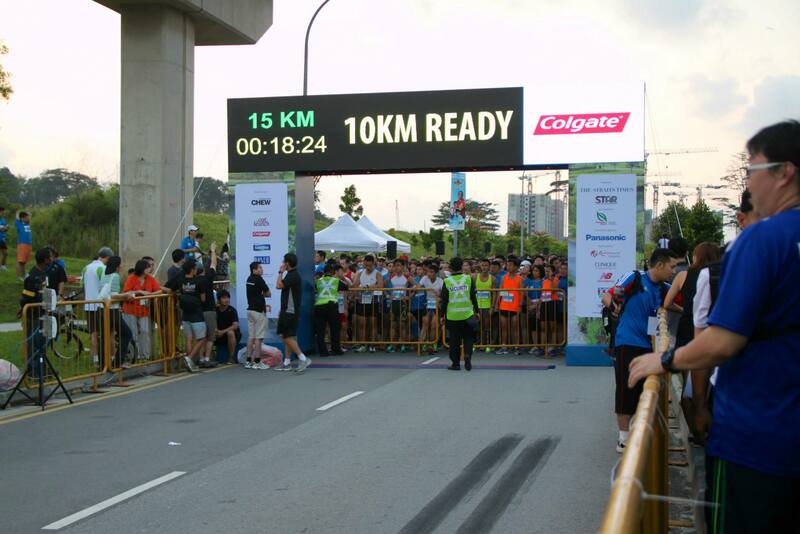 The waterpoint before the F1 Pit building did not help as well, as runners were slowing down to grab water. The 100PLUS hydration point was located at the F1 Pit building, so I gave that a miss as I already slowed down to grab the earlier water. 25 August 2013 – Right after accomplishing my main goal of finishing a triathlon this year, had to refocus on attaining my 2nd goal of this year, which is to get a SUB40 10k. I wanted to put myself in a position where I would have enough chances to get that coveted SUB40 10k. 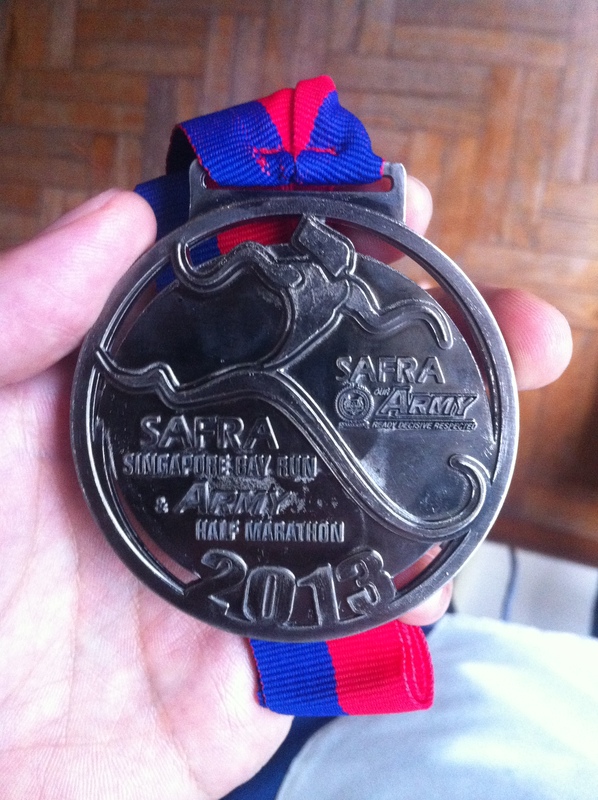 Hence, I signed up for five 10km races in a short span of 6weeks. I know that once I’ve broke it once, the flood gates will open for me to secure more good performances enroute to a SUB1:30 half-marathon & eventually qualification to Boston. Woke up at 0430hrs, left the house after a light breakfast of a banana & some Pocari Sweat. Arrived between 0515hrs – 0530hrs & had to go round to find a parking lot. The Treelodge @ Punggol (Blk305) was completely full, same with a neighbouring block, so had to proceed to a multi-storey carpark at block 602 & finally managed to find a spot at level 5. Headed to the start line & orientated with the starting 100m of the course, before proceeding to do some warm-ups. 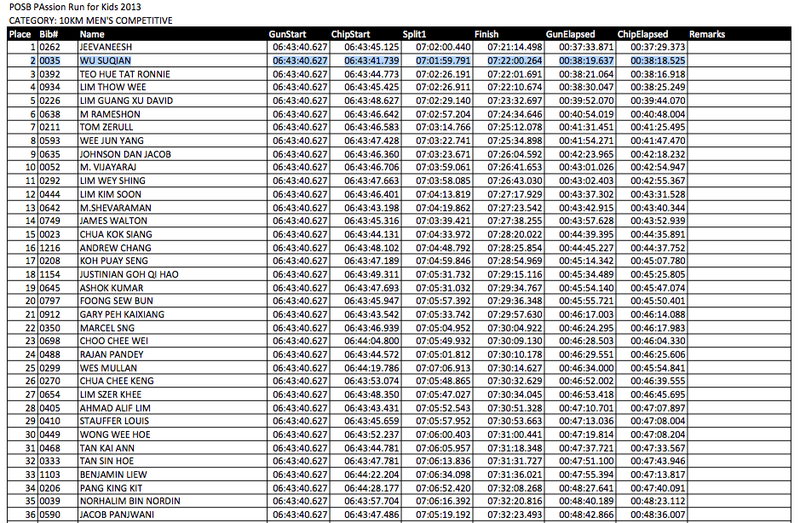 By this time I noticed the top 15km runners already doing some warm runs. 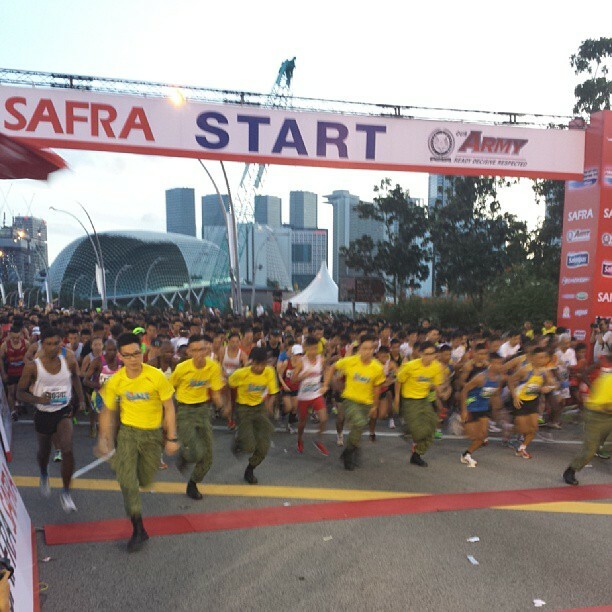 After the 15km flag-off at 0645hrs, I was stationed to line-up upfront, but to my surprise, there wasn’t anyone that was too eager to go right to the front of the line. 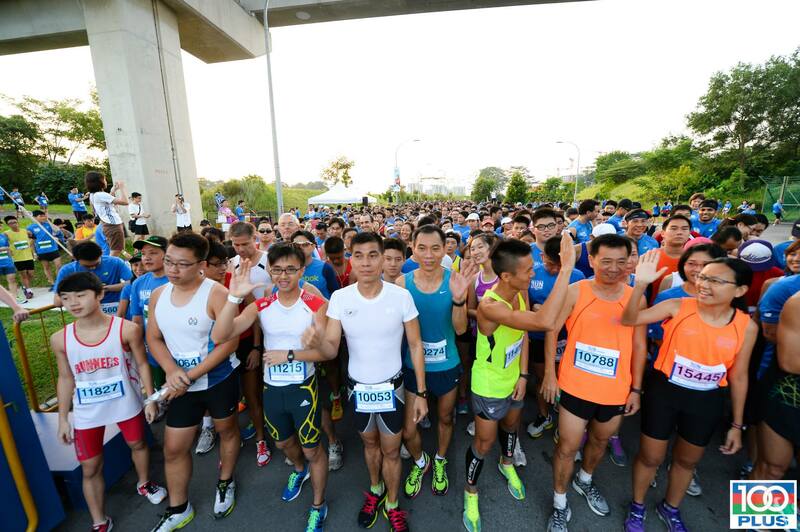 Probably all the top runners were at CSC Run by the Bay, or RunNUS, or in the 15km race earlier on. 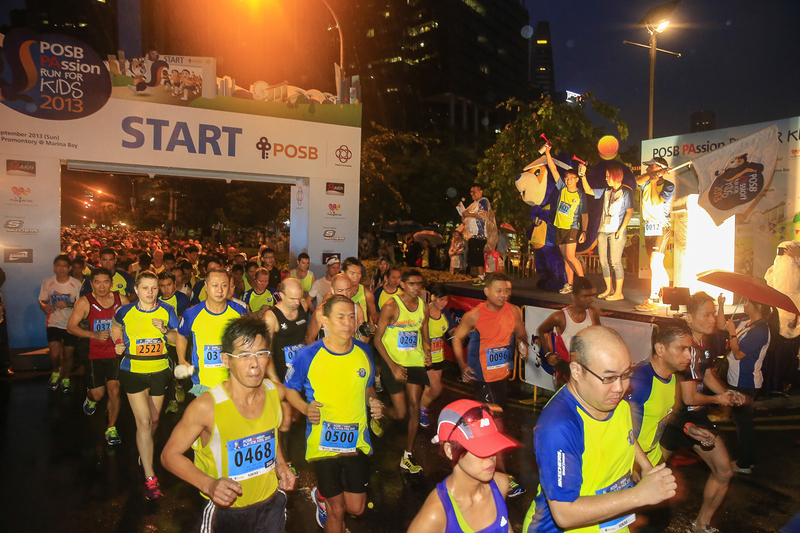 I did notice a familiar face in the New Balance athlete, who I lined-up alongside in the Pocari Sweat Run in June. At the Start Line. Love the LED digital display being adopted here. It was interactive & had sponsors changing from time to time. I’m decked in Neon Green for this run. Hot 91.3fm DJs leading the warm-up in the background. Final picture before the flag-off. 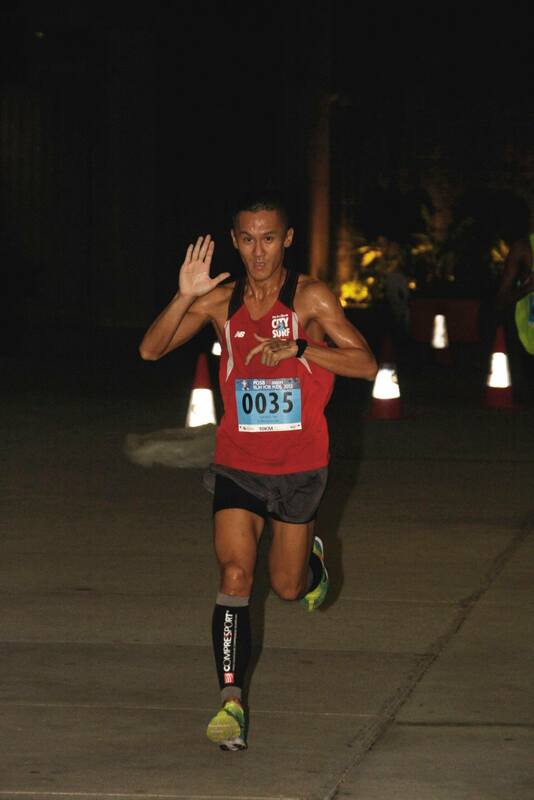 Trading high5s w/ fellow SAFRA Jurong Running Club member, Joyce. Happens that we were part of the winning relay team for SJRC back in 2010. Funny how John & Joyce were promoting their FIXIEs to me at AHM REPC just the day before, & next day I’m lining up with them in the race. Congrats on your 5th place finish Joyce! Metal barricades removed, we are ready to go. 3,2,1 Horn goes off. VIP Flags us off. Here we go! Maybe its instinct, but I immediately took the lead. Which was a terribly bad idea, something that I should really learn not to do. Makes for a good photo, but I would learn to pay dearly in the final km of the race. 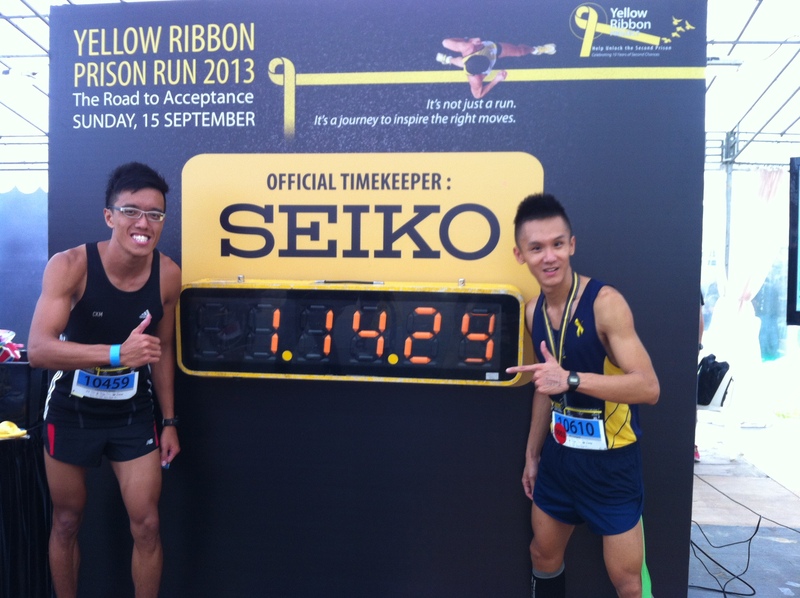 The eventual winner is to my left, he would later finish in a time of 37mins+. He took the lead once we headed down the first slope into the Punggol Waterway. This was heading up the Sunrise Bridge, approximately after the 3rd km. After starting in a 3:30 pace for the first km, I decided to drop it down to 4:00 for the 2nd & 3rd km. Coming up this bridge, I was in a time of 11:30, with a 30second buffer on that SUB40 10k. 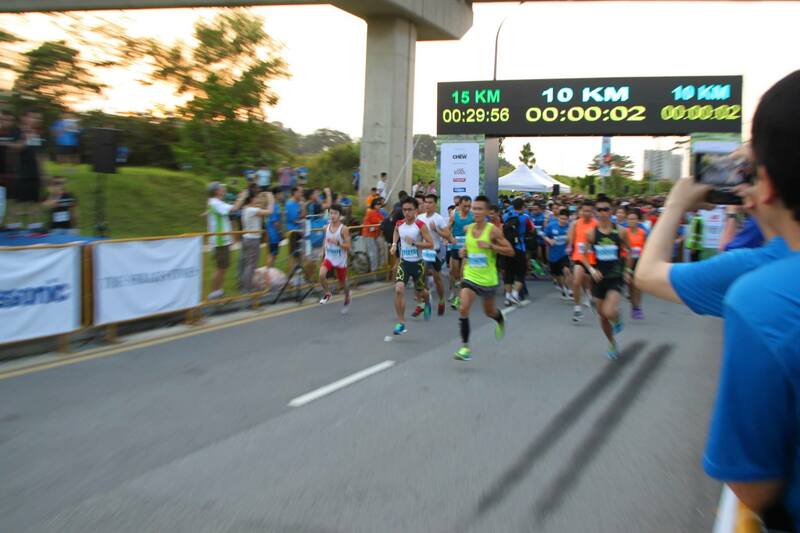 At this point, I was being tightly chased by other 10km runners. The two runners behind me would eventually catchup & overtake me when we entered the trail portion of the race. At this point of time, it was coming into the final 400m of the course. Home stretch, decided to make a dash for the FINISH, even though I knew it was too little too late. At the hydration point after the FINISH. Spotted Mr. Chasing Shots, the man behind the camera at many races. Had a chat with him & asked him why he does it? Camera was underused, & he liked doing it! 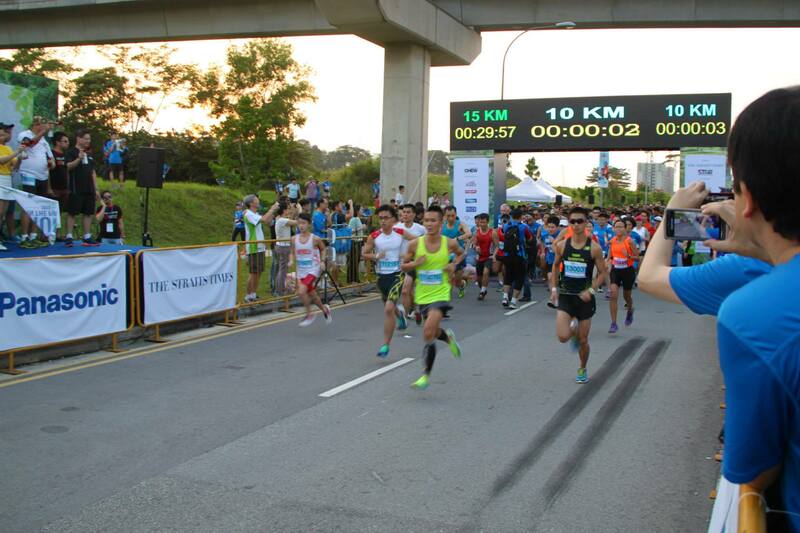 Really respect the guy for taking photos of runners pro bono, plus he is super friendly! Congrats on your PB! Some photobooth fun at the Carnival area. I know I always say it, but I absolutely love the medal for this run, a Traditional, round, weighted medal that doesn’t feel cheap. Was fortunate enough to be amongst the Top25 for the Men’s Open Category, so I had a Winners medal on top of the Finishers medal. I was also lucky enough to come in Top10 for the first time ever, hope it won’t be the last. 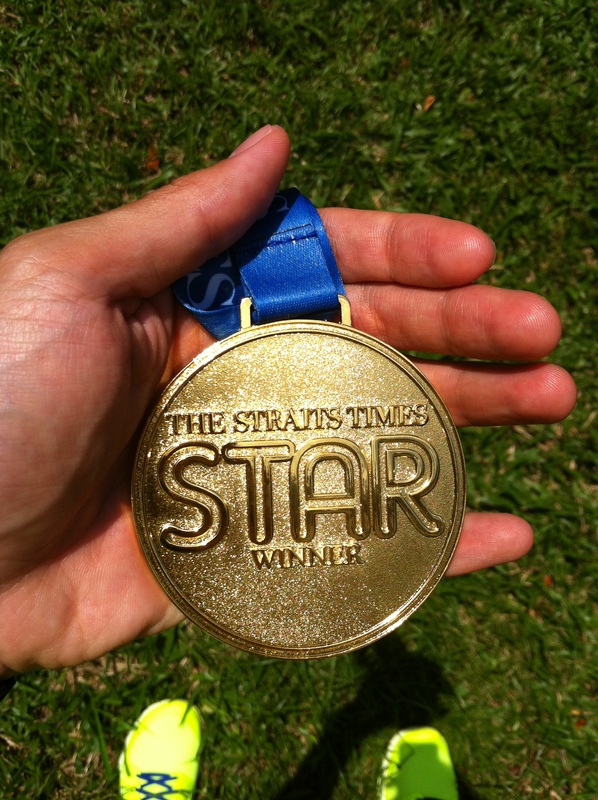 no PB or SUB40 10k today, but somehow managed to win free one-year Straits Times subscription for my family! 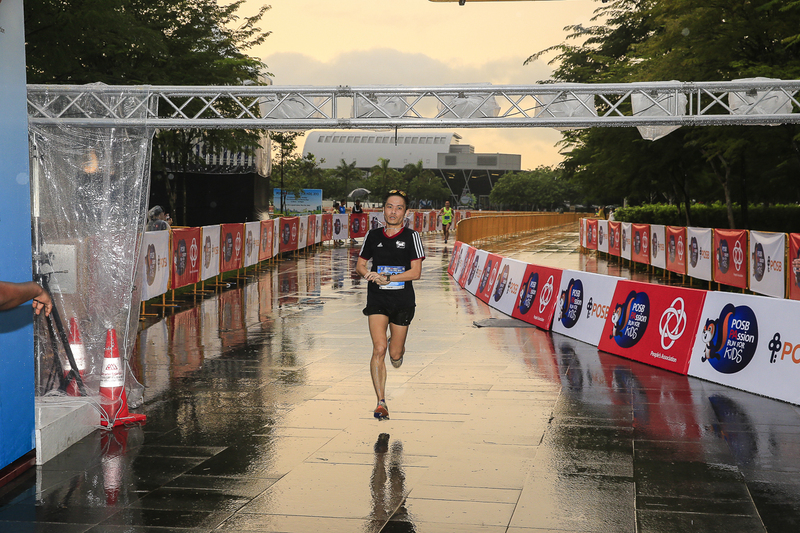 Reflection: In the lead up to this race, I was expecting to run the KOTR, but it was cancelled. That week I suffered a minor hamstring pull after not cooling down properly after a swim. Hence, I had to scale back the miles to prevent further injury. I also came down with a virus that very same week, having a bout of sore throat & flu symptoms. I couldn’t complete key workouts like a 4 X 2km workout due to the hamstring injury, I had to pull out after my first lap of my 2nd set. So I didn’t have the confidence going into that race. I’m glad it was cancelled as I could smell disaster pending. The tuesday following the triathlon, I managed to complete the key 4 X 2km workout, giving me confidence that I could do it if I maintained a constant pace from the start. But I emphasize constant. This race, I was looking out for a fast runner that could do 39mins for 10km, but scanning the field, I couldn’t recognise anyone that I knew could do it. It seemed that everyone was reluctant to go to the front of the pack, maybe its for good reason. This entire race was more mental than anything else. I was focused throughout, stabilizing my pace from 4-9km, hitting all the kilometer marks with at least 30seconds buffer. 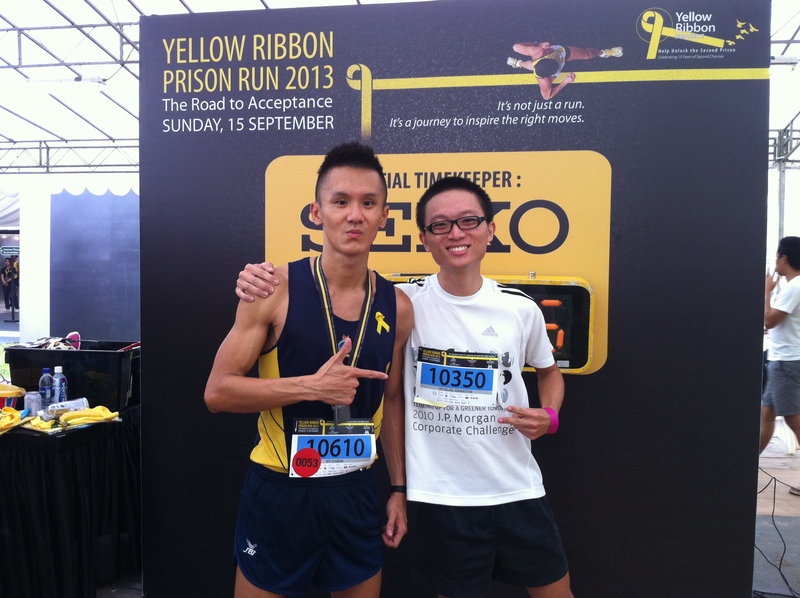 Have to thank a fellow runner, Ronnie, who was pacing me from 4-9km. 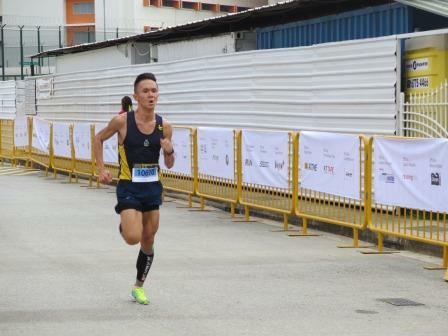 The moment he was running by my side, I felt more confident. He signalled for overtakes a couple of times, and even offered his drink to me at the Hydration Point! But I already grabbed the wrong cup(water), should have got an isotonic drink instead. This proved deadly coming into the last km. As we stepped up the pace for the final km, it was Ronnie, a guy in the Trail running top & myself heading strong together. But then the severe stitch occurred. & no matter how much I lifted my arm & exhale on the right foot, the stitch wouldn’t go away. I just had to bear with the pain & turn it down a notch, letting the two runners go. 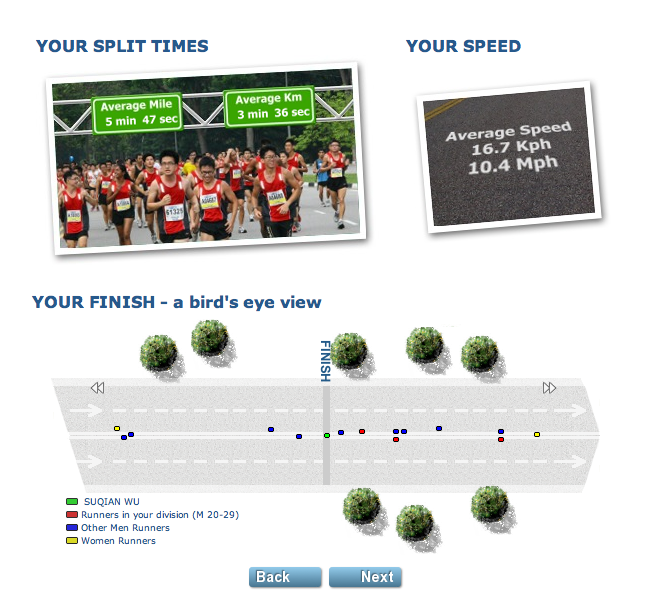 Felt incredibly slow coming into the FINISH line, this is something I will work on in training. The inner tights I was using was too tight & constantly riding up, causing diaphragm not to be able to function to full capacity. For some reason, I started to alter breathing pattern to “rhythmic breathing In-2, Out” fast & shallow breathing at 9km mark, causing the bad stitch. When I get tired, I tend to disregard my running form, & have a tendency to look down on the ground rather than look far ahead, this causes the head to tilt downwards slightly, & blocks the airway to the lungs. My body posture starts to slouch, & this could be the cause of the stitch. In fact, come to think of it, I felt it coming, my abs were starting to cramp, probably due to the bent over posture I was adopting. My legs also tend to feel heavy & can’t lift as high as I would like. This is something I definitely would be working on in training. I started at 3:30/km pace for the first km because there was just two runners ahead of me, & I was just keeping up the pace. As I am just wearing a very basic Casio watch with just a stopwatch function, I have to rely on the distance markers to determine the pace I am going at. Hence, I am constantly caught out at too fast a pace if I follow the front pack. Next race definitely will start conservatively & overtake runners from the back rather than get overtaken & messes with the psychology of racing. 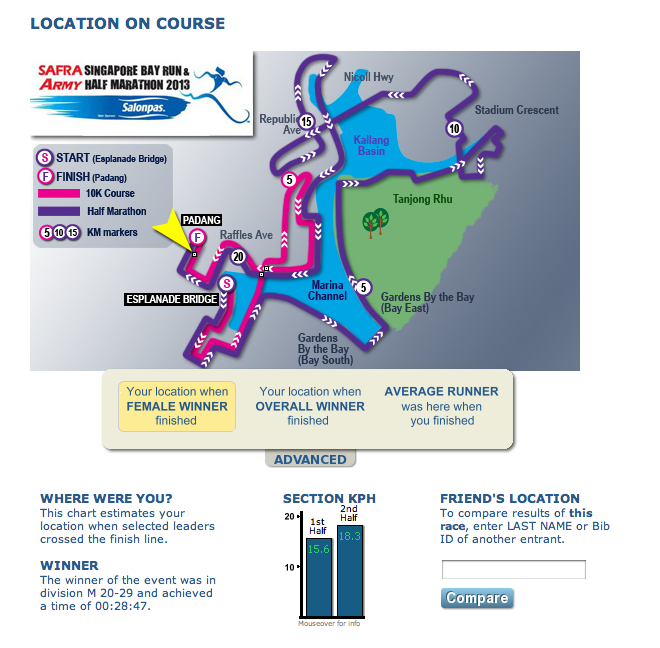 Race Course Advice: The whole course is nice & flat, there was a potential choke point on the Sunrise Bridge, but to my surprise, when I got there, it was not bottlenecking at all. 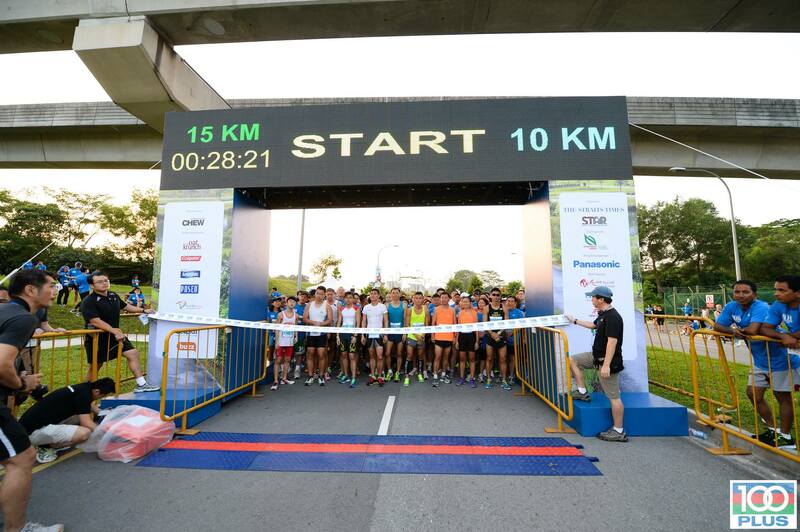 Maybe its due to the fact that it was still early on in the race & the majority of the 15km runners have not passed that point. There is a trail section on the portion adjacent to Serangoon Island. Big fan of trail in training as it is light on the feet, not so much in racing as it tends to slow the pace down. 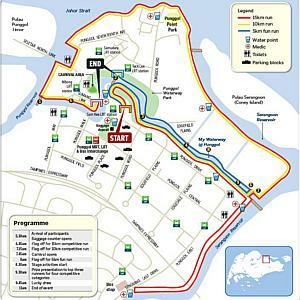 Enquire with a few runners, most told me that the course was 10.20 – 10.22km long. Hence, it would be an additional 30-50 seconds to cover. Maybe its a consolation to myself, but I think my performance was sub-par & lacklustre. Time to turn it up a notch for Army Half Marathon. Recently, I have been struck down by a sudden onset of lethargy, fatigue, & virus symptoms. I have been watching my diet & food consumptions pretty closely for the last couple of months, making sure I get the proper nutrition I need for the intensive training I put in. Besides the occasional CHEAT days & REST days, almost everyday is a training day. This week I took 3 REST days. Now, that’s a record. After a swim session, I forgot to do cool down stretching, & felt my right hamstring during my evening run. It was uncomfortable & I knew something was wrong. I did not want to aggravate it, so I slowed down my pace & made my way back slowly. This was an evening run, ending around 11pm, which I felt was a bad idea in hindsight. It had caused my heart rate to go up, so I could not sleep till 1am, which was bad, as I had a hard interval session scheduled the next morning. Consequently, the next day, I woke up pretty late, & could not muster the energy to head out the door. I played mind games & told myself, I’ll do it in the evening, but lo-&-behold, I did not do it in the evening. The next day morning, I went out with the intention of getting it done, only to find out there was a sports meet going on in my local track that morning. Had to postpone the training till evening. When evening came, I got down to the track, full intent with finishing off the 4 X 2km intervals that I wanted to do mentally prep myself to be able to do a SUB40 10k that weekend. I did the first rep, it felt good, I came in well below my target time of 7m40s for 2km. When it came down to the 2nd rep, I felt the sudden need to regurgitate, probably an effect of over-hydrating prior to the interval training. Had to slow down & cut-off the entire exercise as I wasn’t feeling well. This weekend also coincided with the Hari Raya & National Day public holidays, so there was a long weekend ahead. I was involved in the National Day celebrations, & spent an entire day outdoors & cheering till I almost lost my voice. Perhaps its time to scale back on volunteering activities to concentrate on the core business of running. Although I’m down, but I’m not out. I’m looking forward to this weekend as it will be the first time I compete in a triathlon, albeit its in the freshmen category (i.e. 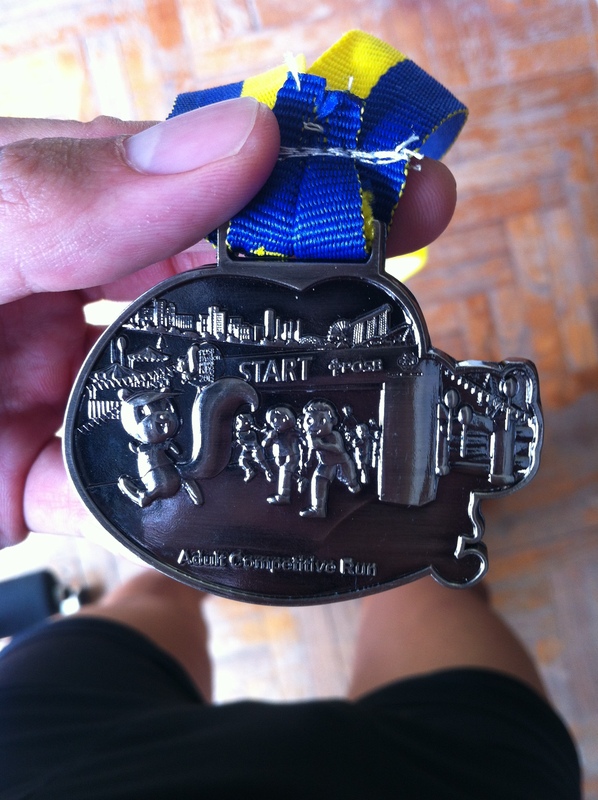 200m swim, 10km bike, 2.4km run). This is something that I have set out to do almost a year ago, & I hope to FINISH it. 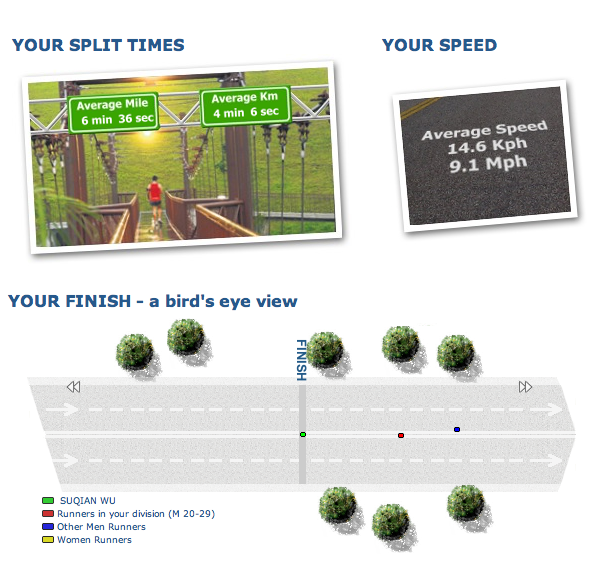 This would definitely pave the way to execute longer distances in triathlon (i.e. sprint, 70.3, Ironman). Every year I’ll try to make the step up to the next category in preparation to eventually complete an Ironman. Penning my thoughts down in this blog post definitely allowed me to spot some critical errors in training which I will take into consideration in the future. I will have to tweak these bugs out in order to get the optimum efficiency. As for the last paragraph, refocusing on the goal is a great way to steer the vehicle back on track. 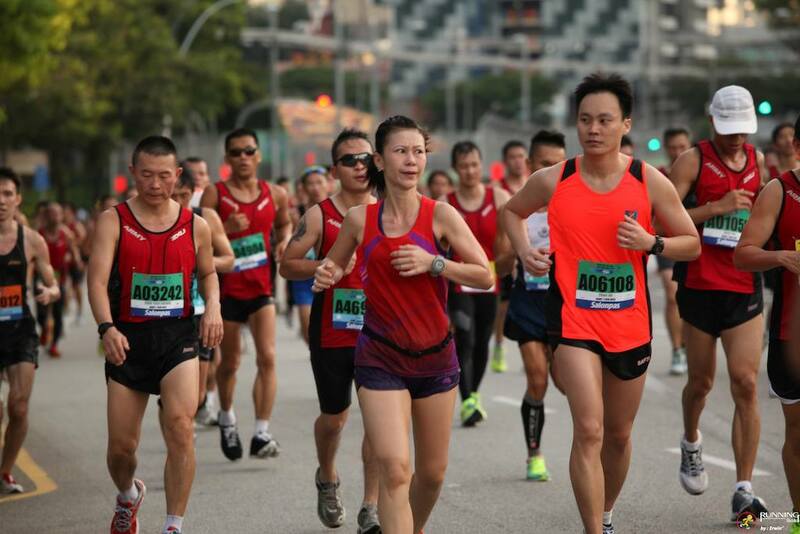 Hope I get back on track ASAP as I head into a congested race calendar with 5 back-to-back races lined up every weekend from 11 Aug to 15 Sep.